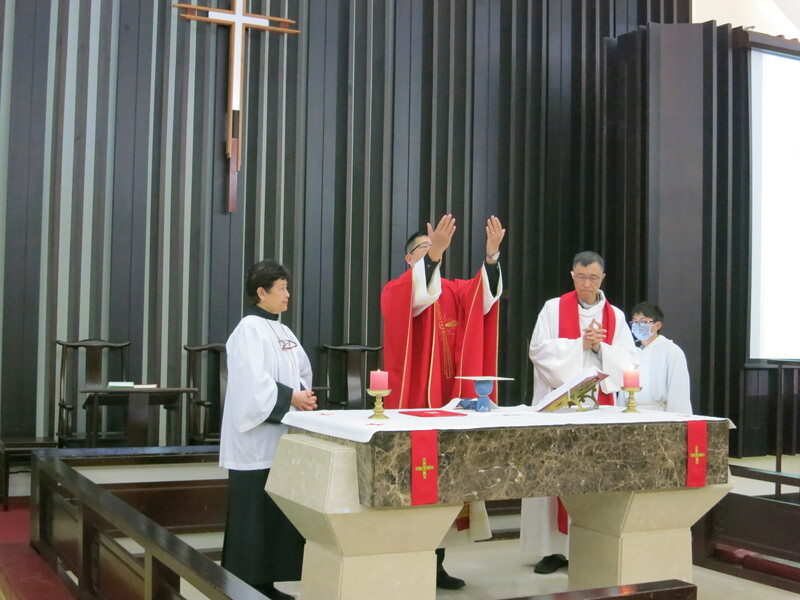 Just spent Palm Sunday weekend at St. James’ Church, Taichung where I was assigned to do the sermon in the English service. 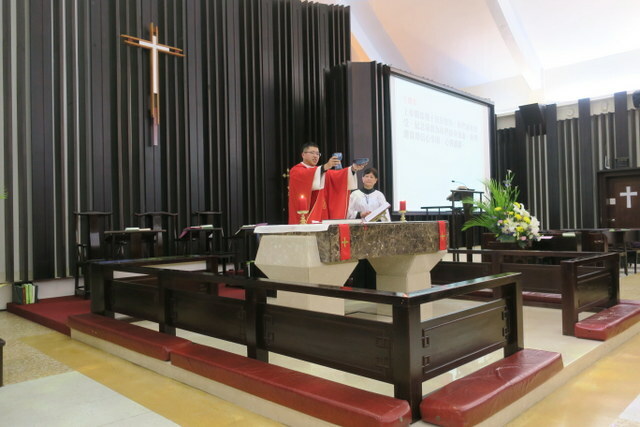 It seems that usually, with only an hour for the service, they don’t have time for a Palm Sunday procession and miss out the readings for Palm Sunday too, just concentrating on the ones for Holy Week. 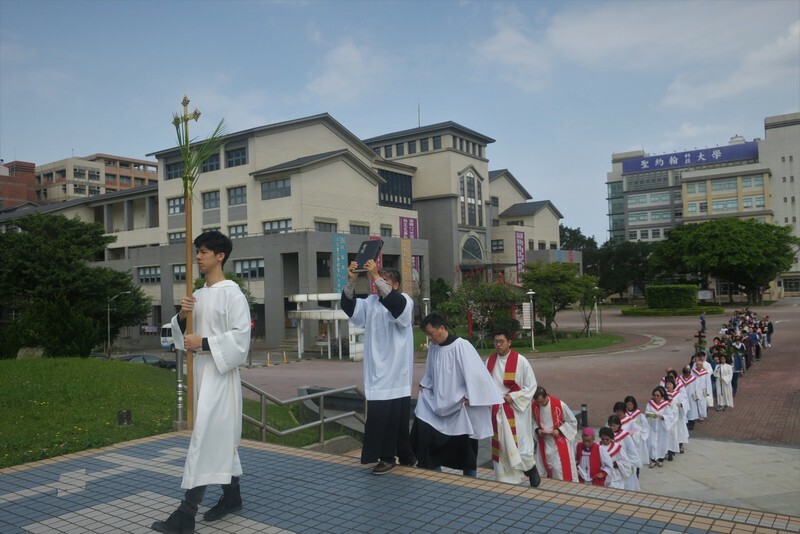 But my Palm Sunday sermon, based on Jesus riding into Jerusalem on a donkey (the Palm Sunday liturgy) was all prepared when I discovered that fact. And so it was that Rev. 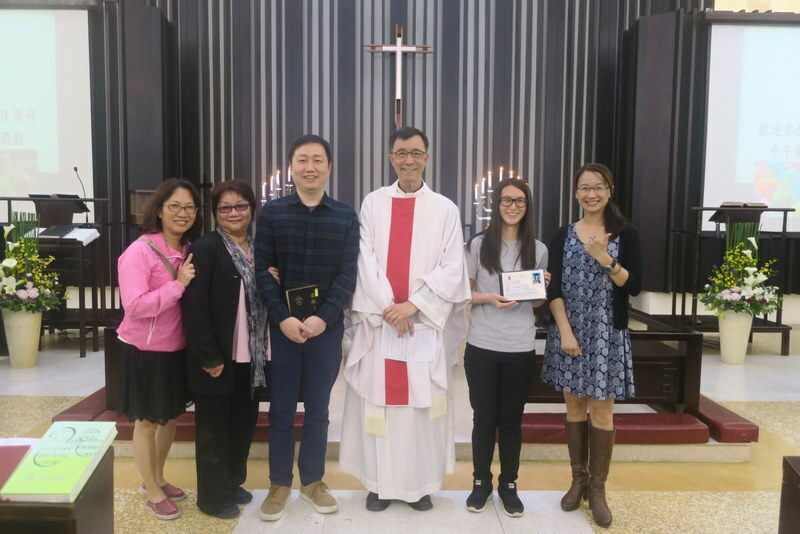 Lily Chang kindly rearranged the whole service, and for the first time, St. James’ English Service had the Palm Sunday Liturgy and Palm Sunday Procession, waving palm branches and shouting ‘Hosanna’ as everyone walked around. 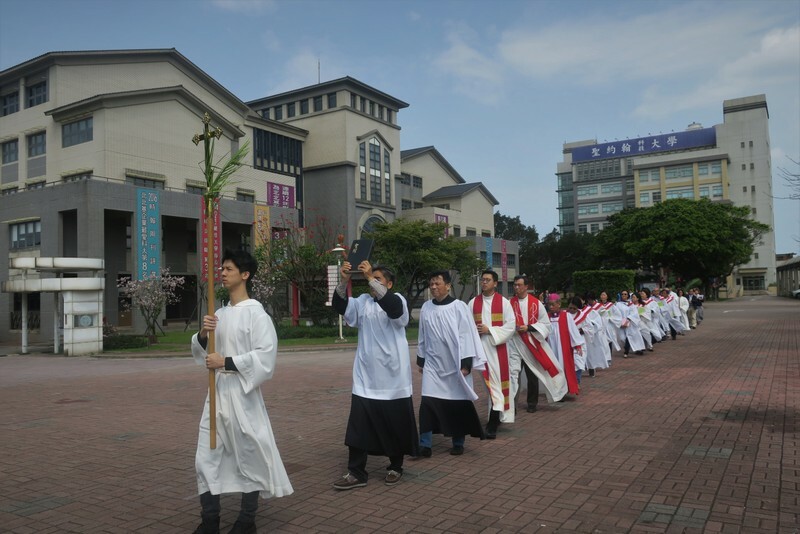 The Chinese congregation had a Palm Sunday Procession that went around the streets of St. James; the English congregation had a smaller one, just around the church building ~ but in its own way, just as meaningful. 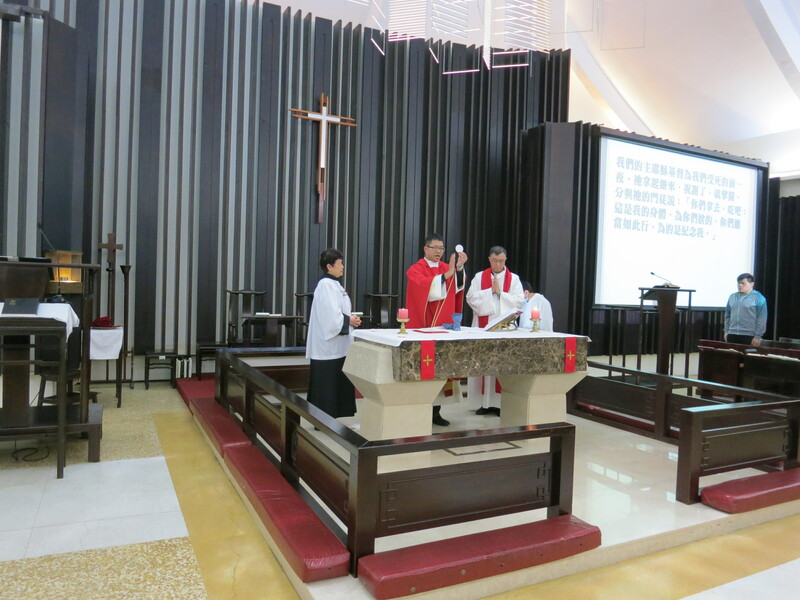 We also had a choir, formed from the English congregation, who sang all the traditional Palm Sunday hymns and songs. 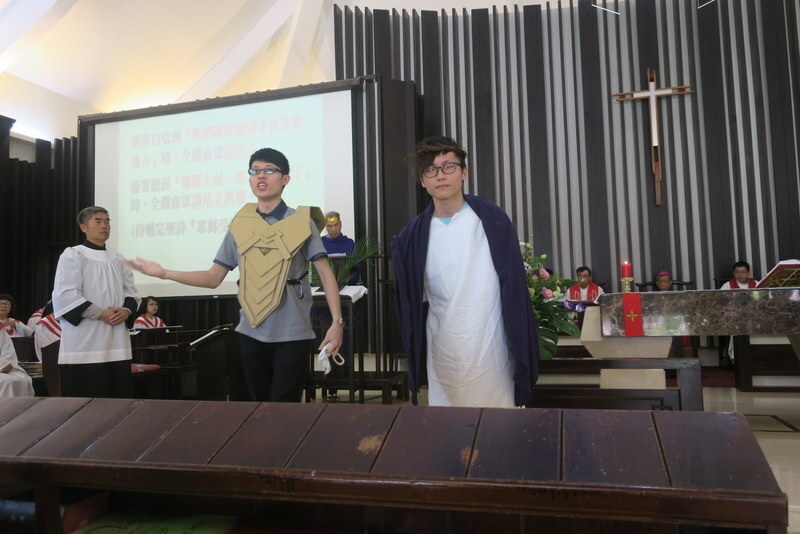 This was not the only major event of the weekend going on at St. James. 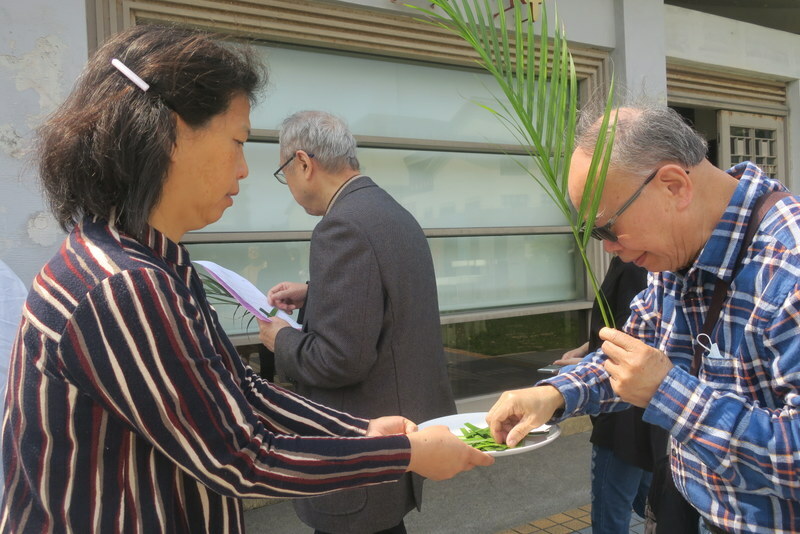 On the Saturday morning, we had the first of 3 Bishop Candidates Public Forums for all the church members in central Taiwan to meet and hear from the 3 candidates nominated for election to succeed Bishop Lai when he retires early next year. 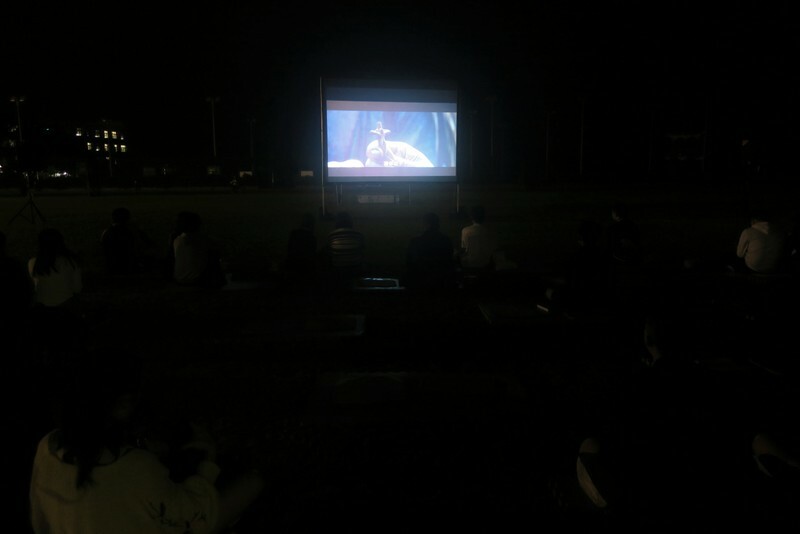 About 60 people came along, and it was very worthwhile. 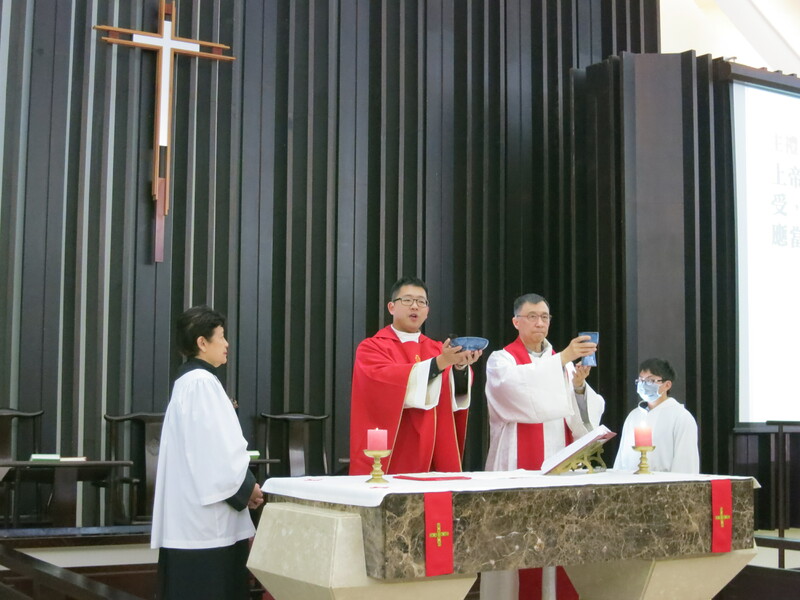 Report coming in a few weeks, when we’ve had the next one, in Kaohsiung. And in-between times, I went off to visit my old friends, these are the Lai family, and the 2 girls are my former pupils, now all grown up! So great to see them! 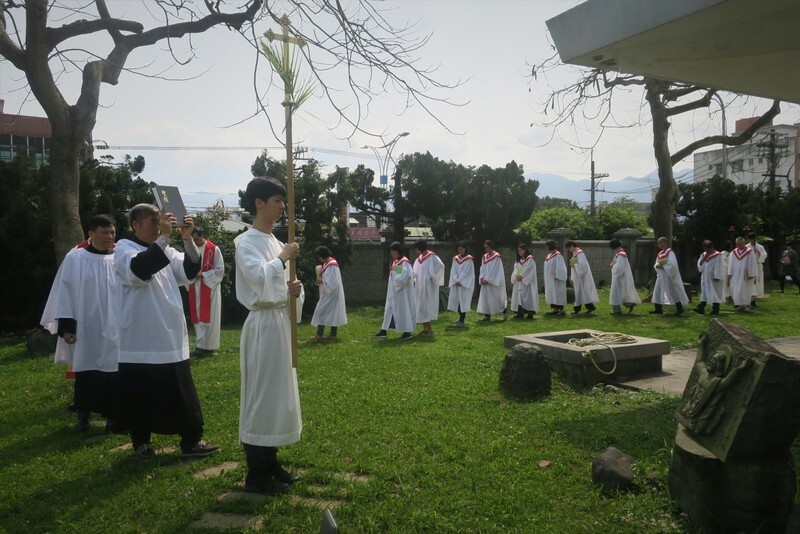 Came back home yesterday into major traffic jams caused by processions of worshipers, deities, musicians and vast numbers of people celebrating a traditional Taoist festival, marching along the sides of the roads along the streets of Tamsui and further north. 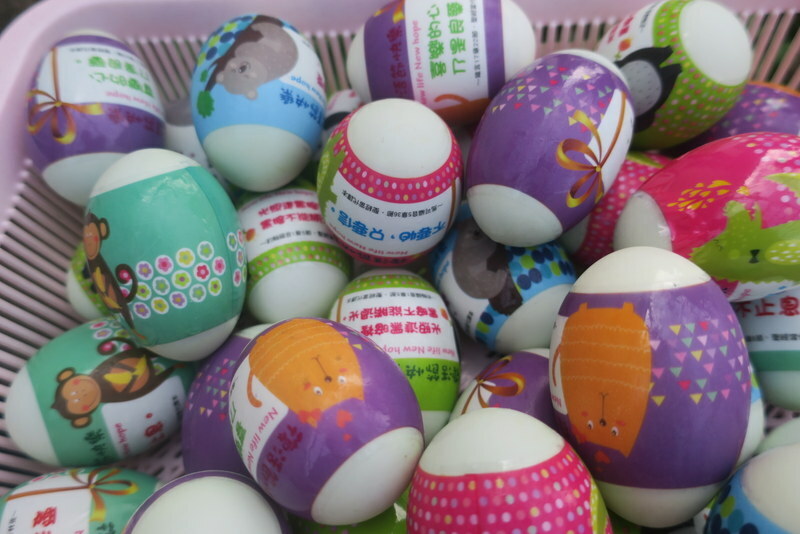 Just as the date of Easter is set by the Lunar calendar, so the week before Easter, when we are observing Holy Week, that same week is always also a busy time for temples in this area, who are observing the same Lunar calendar. The 860 bus route from Tamsui, that normally takes about 25 minutes, instead took an hour. Ah, I was so happy to arrive home! So wishing you all a meaningful Holy Week as we remember Jesus’s last supper with his disciples, his arrest, trial, crucifixion and death on the cross. 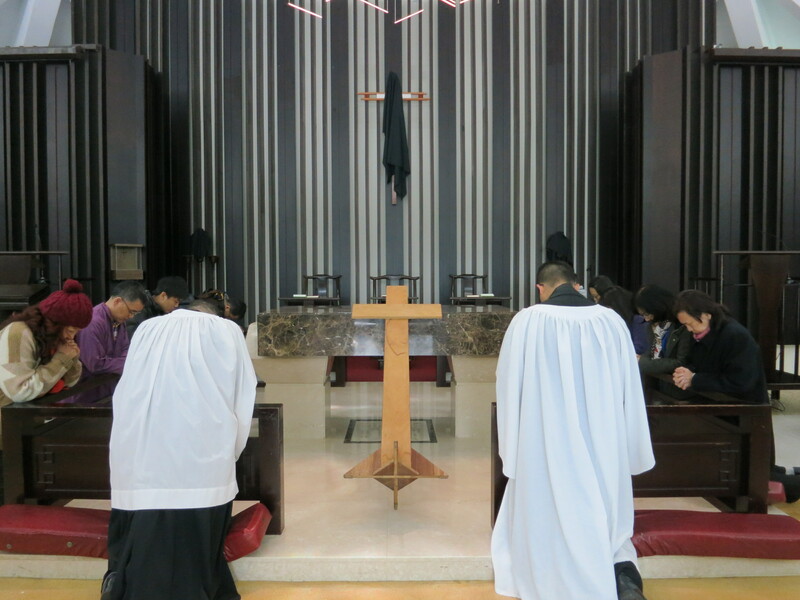 Do take time to pray, reflect, meditate, contemplate, worship, remember, fast, observe and take part in the events going on in churches around about. It’s the most important week of the Christian year, so do get into it! 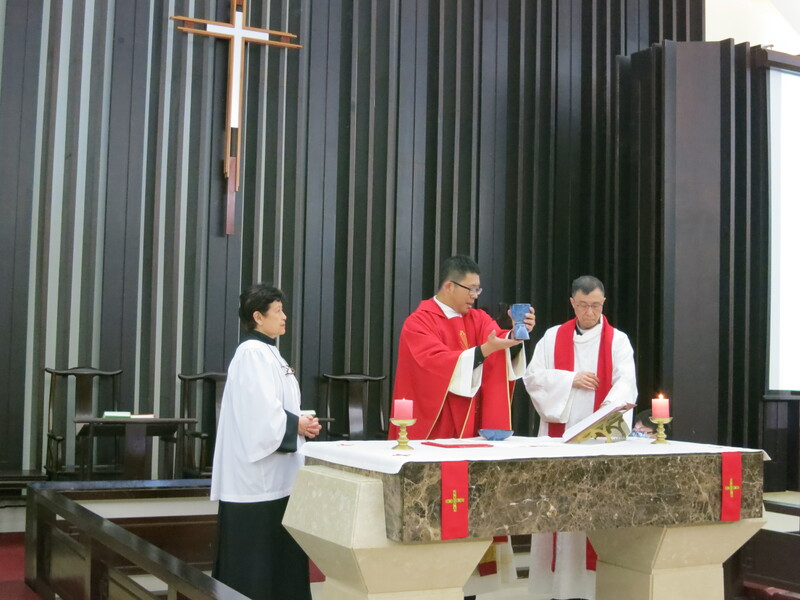 Holy Week and Easter 2018 @ Advent Church, St. John’s University, Taiwan! 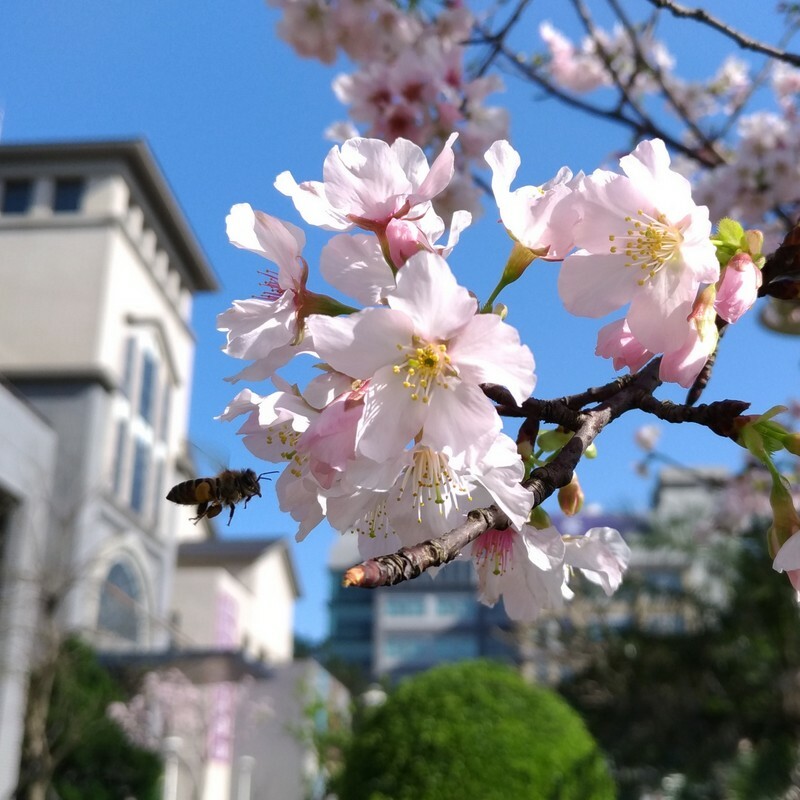 And the sun’s been shining all week, and the cherry blossom was still out at the beginning of Holy Week…..
Holy Week started last Sunday, Palm Sunday ~ YES! 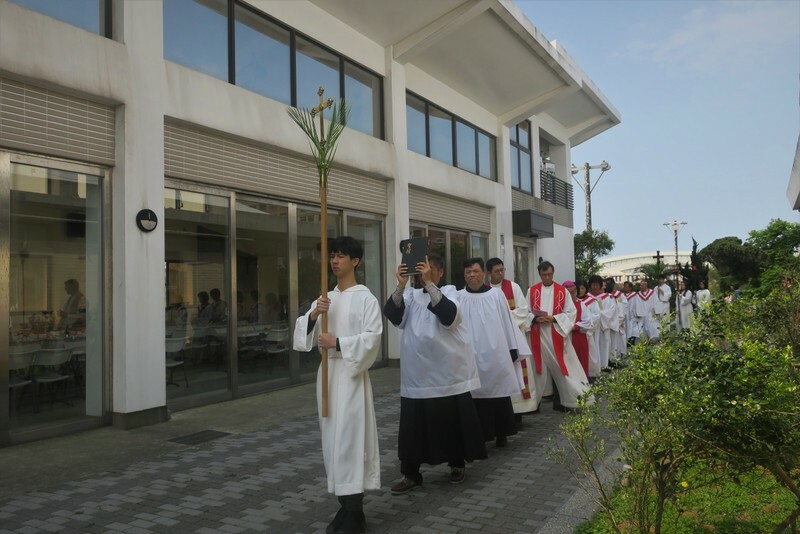 We began our Palm Sunday service with a procession around the main entrance of St. John’s University. 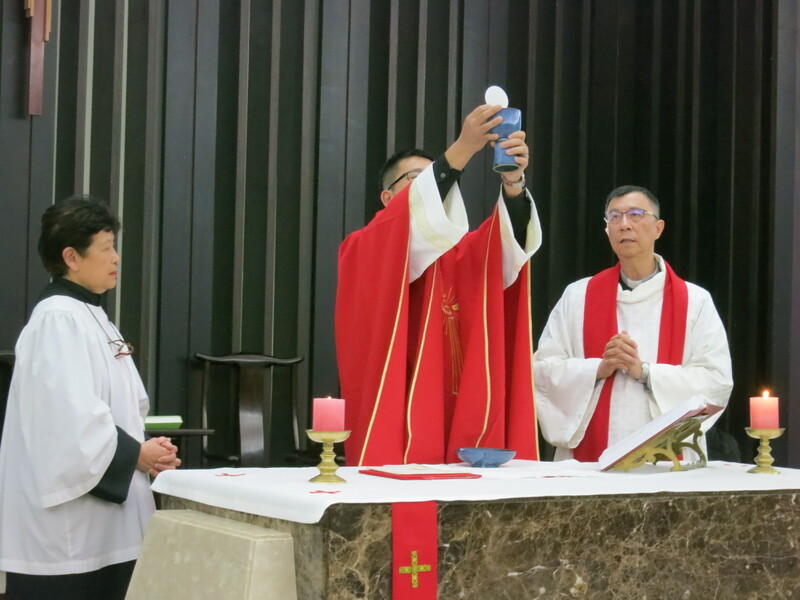 We were very pleased that Bishop Lai was able to join us for the service and procession too. 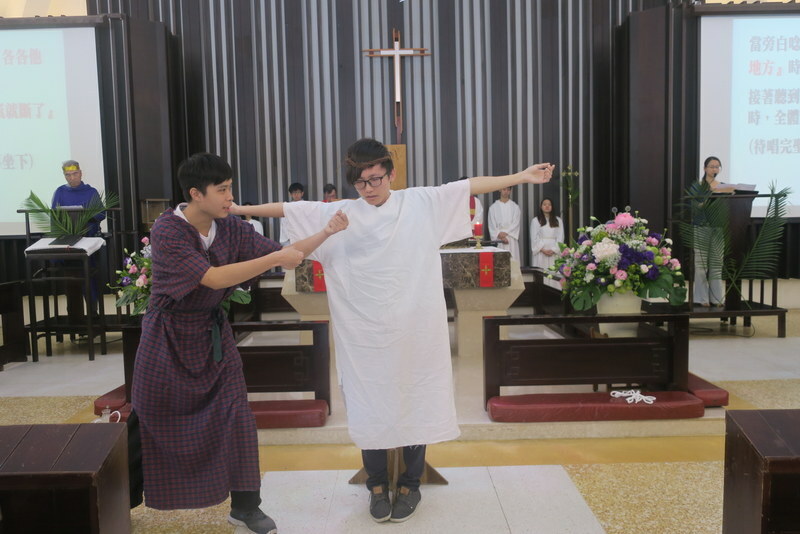 During the service, we had a dramatic presentation of the events of Holy Week, acted out by our students, past and present…..
Then on Monday night, the St. John’s University ‘Movie Club’ showed the movie ‘Silence‘ 沈默 on a big screen on the main playing field. 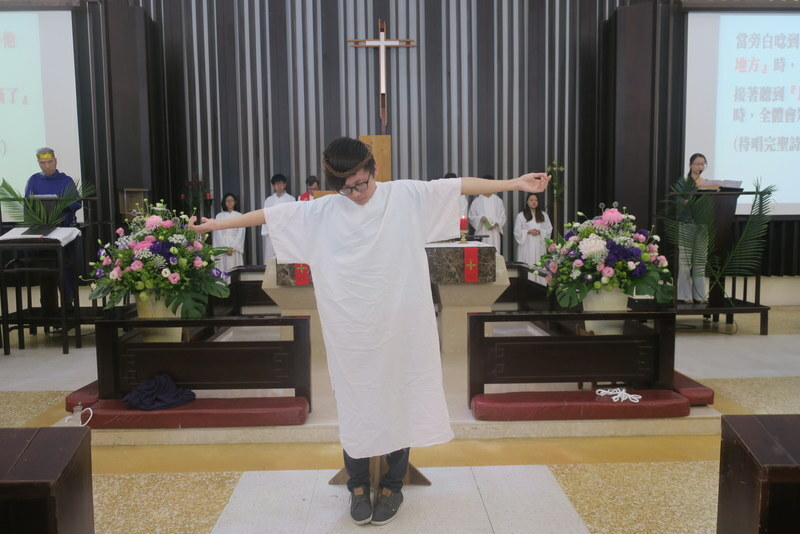 This was not done intentionally for Holy Week, rather they had to choose an evening when there was no baseball practice, and they chose the movie because it was filmed in Taiwan. 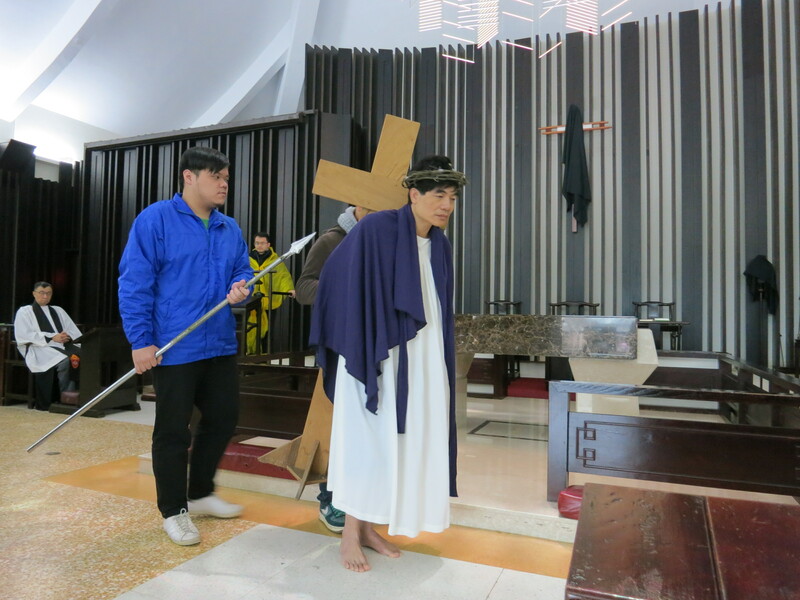 But it so happens that it was so appropriate for Holy Week – and quite a number of us turned up to watch. This was my second time to see it, and it’s much improved on the second viewing ~ like I knew when the gruesome bits were coming up, but also I noticed things I had missed the first time round. Still utterly compelling and challenging. Brutal and horrific, and yet also so moving. 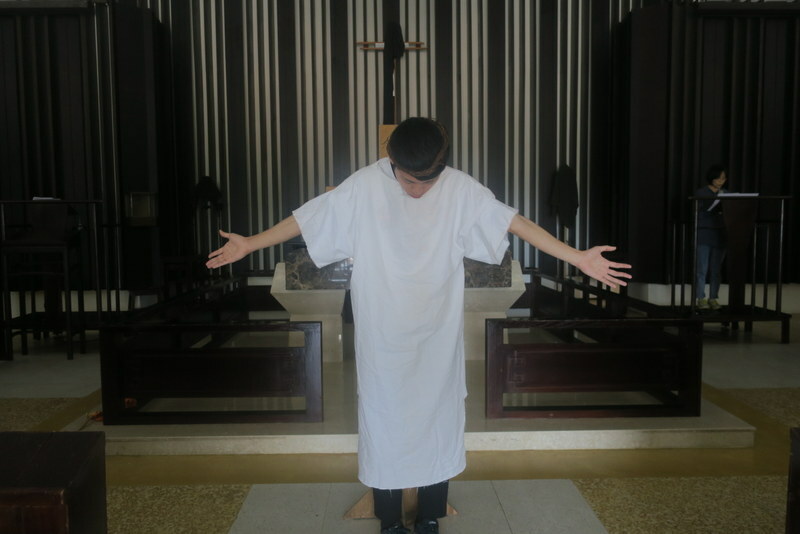 And so fitting for Holy Week. For me, this was one of the highlights of the week. 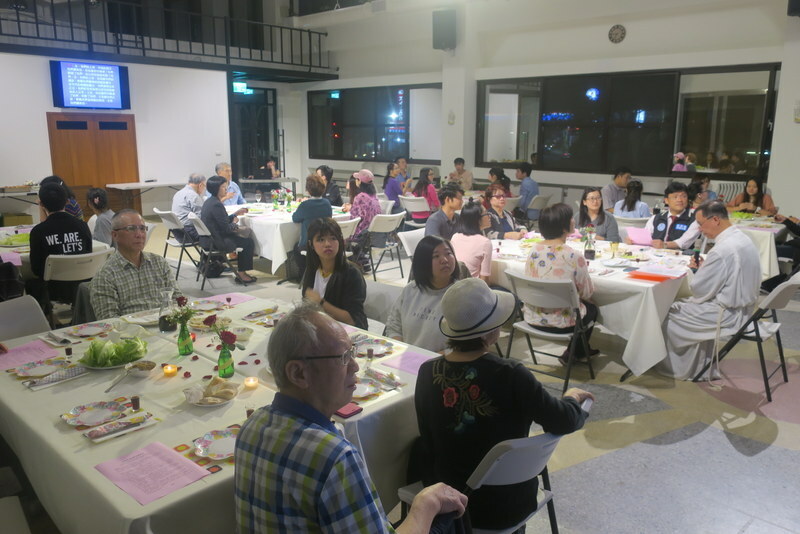 On Maundy Thursday, we held our Passover Meal in the Advent Church Center, and a wonderful mix of students and adults came along. This took a huge amount of work and preparation, but all worth it. We were so pleased to welcome SJU President Ay and his wife too. 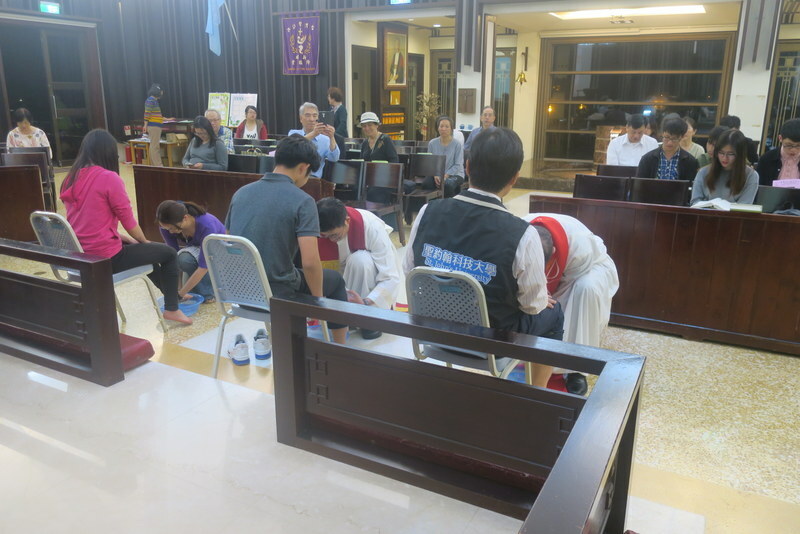 During the service that followed in the church, we had foot-washing. 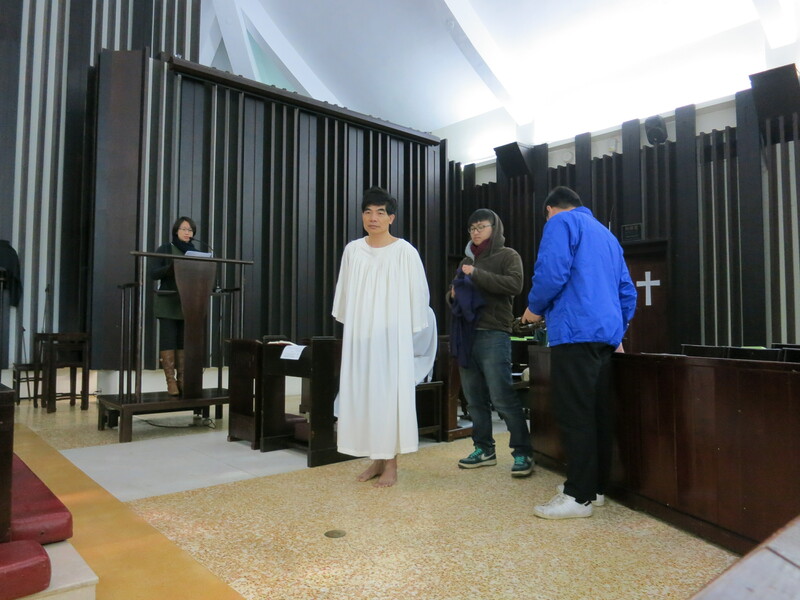 President Ay had his feet washed by our rector, Rev. 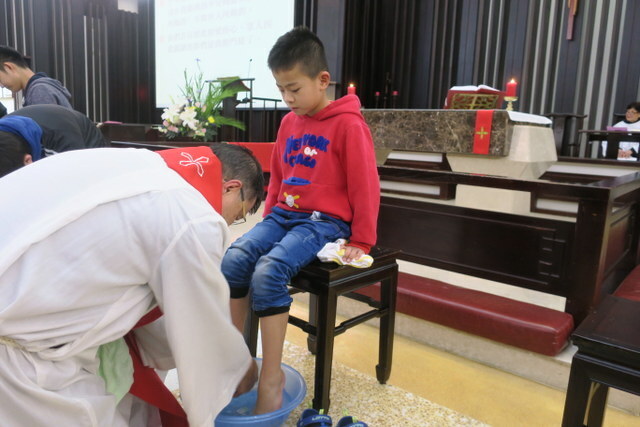 Lennon Chang – the teacher washing the feet of his former student. 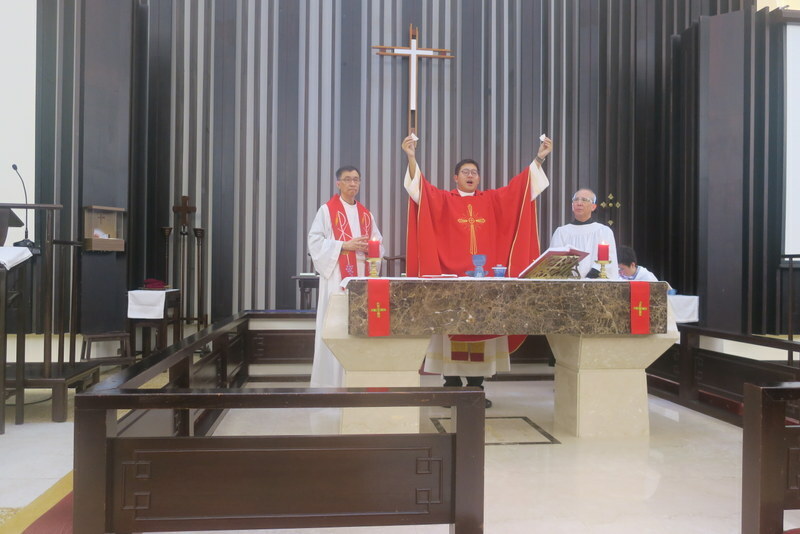 We also had our chaplain, Rev. 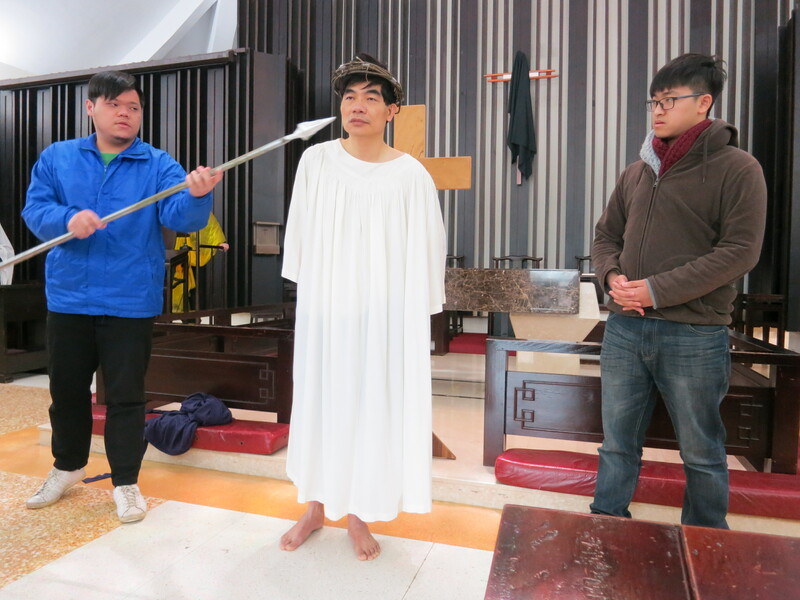 Wu Hsing-Hsiang, washing the feet of Jin-Ching, our SJU Student Fellowship Leader, and Shu-Jing from our chaplaincy washed the feet of Pei-Ching, one of our 4th year students who was preparing for her baptism on Easter Eve. 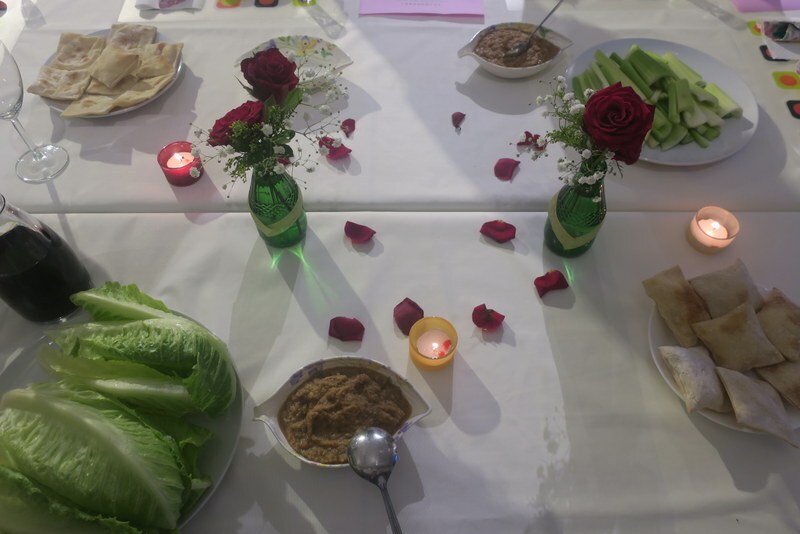 We celebrated the ‘Last Supper’ together, remembering the evening when Jesus instituted the Holy Communion, and shared bread and wine with his disciples just before his death. 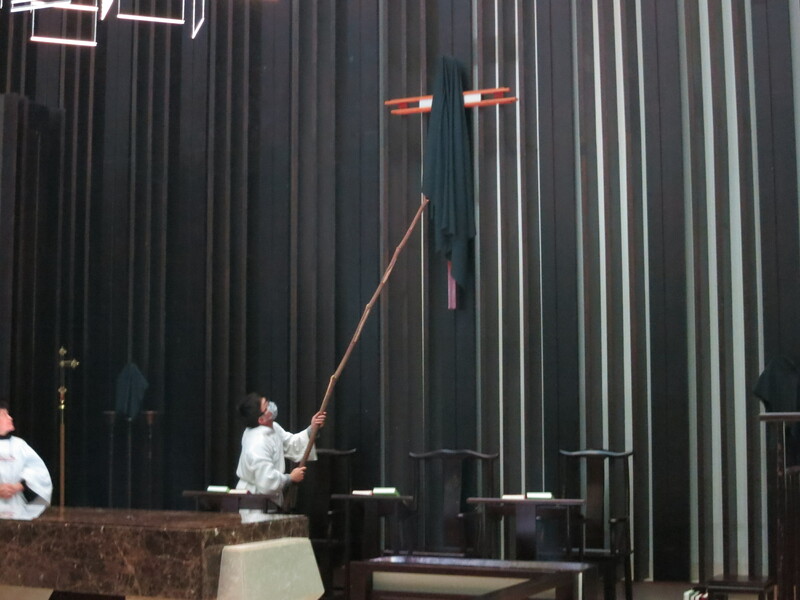 The altar had been stripped after the service on Maundy Thursday, and the crosses were covered in black cloth. 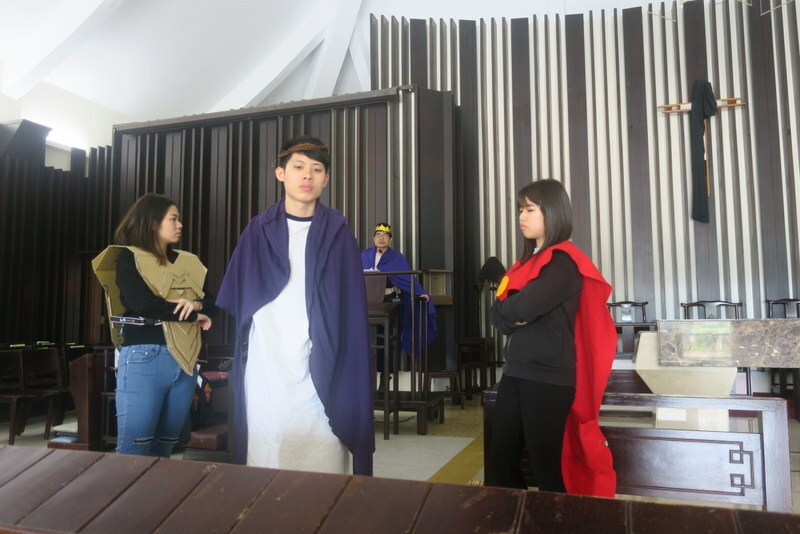 On Good Friday, it being a working and school day, we had a lunchtime service with our students, faculty and staff acting out the events of Good Friday – the trial, crucifixion and death of Jesus, and we finished in silence around the cross and the altar….. 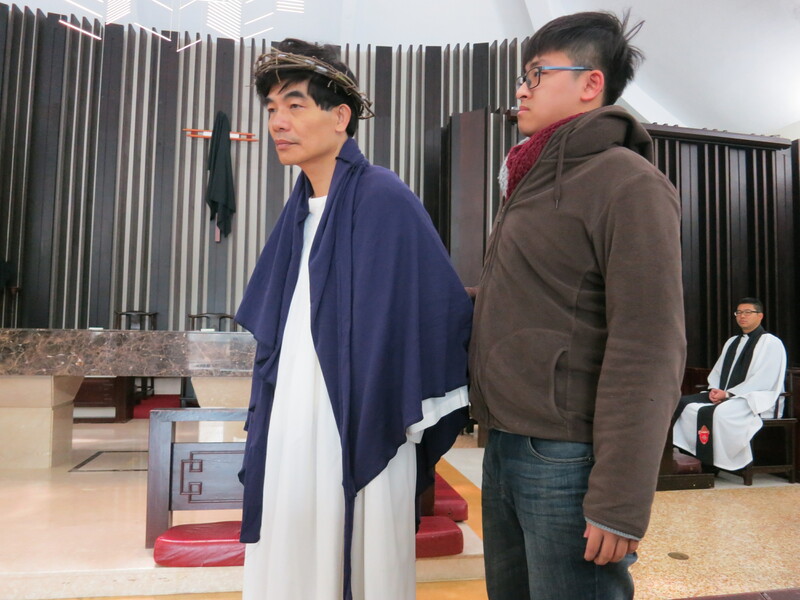 I was outside taking photos during the baptisms, along with a little 2-year-old and his father. He was totally absorbed in watching events inside at the font…. 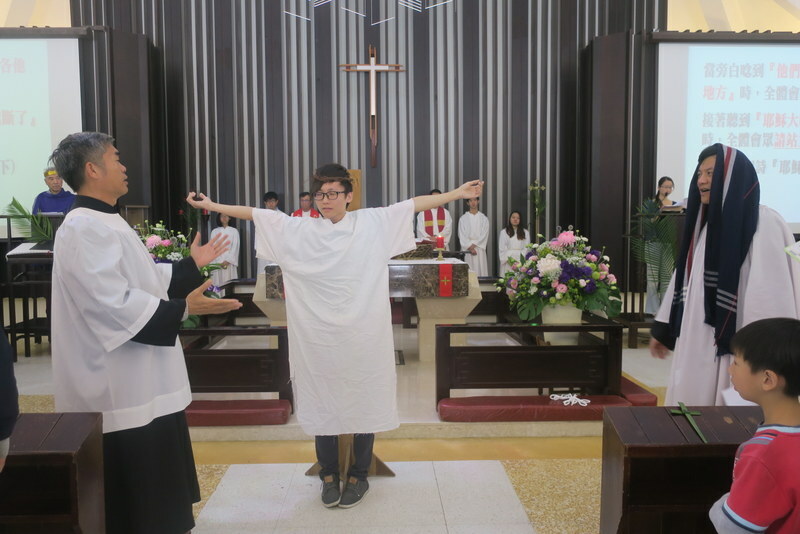 This morning, Easter Day, we could truly say, ‘Christ is risen, Alleluia!’ I even wore a skirt for the occasion, and got mentioned in the Notices as a result! Advent Church was filled with wonderful choir music as our choir sang and sang so much beautiful Easter music. 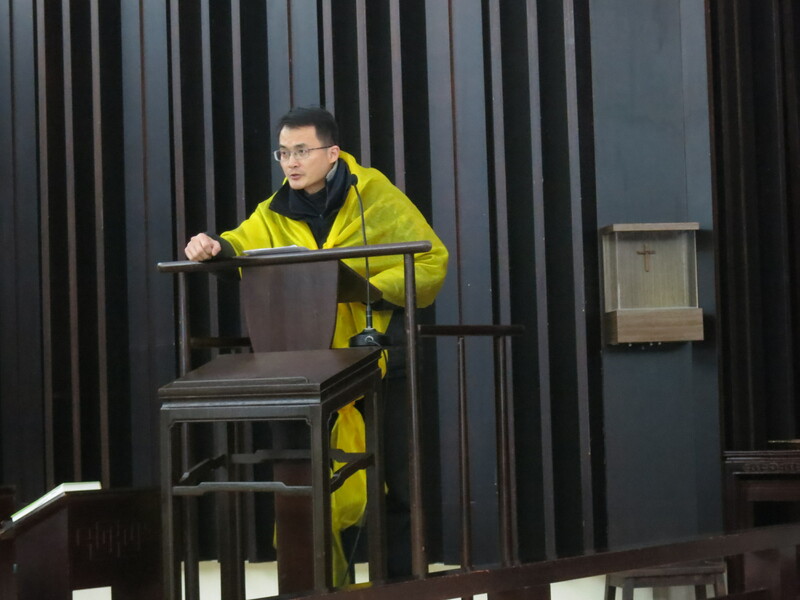 Yu-Jie accompanied the choir on the piano, and glorious sounds filled the church! 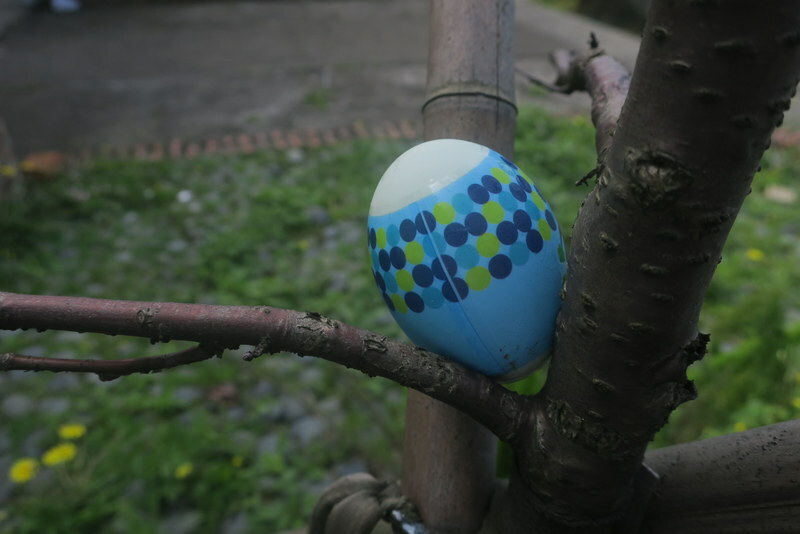 Ah yes, and to finish, we had an Easter egg hunt! And then we had lunch and birthday cake – celebrating all April birthdays. Here we all are at the end of the service singing happy birthday together! And so, wishing you all a Happy Easter. 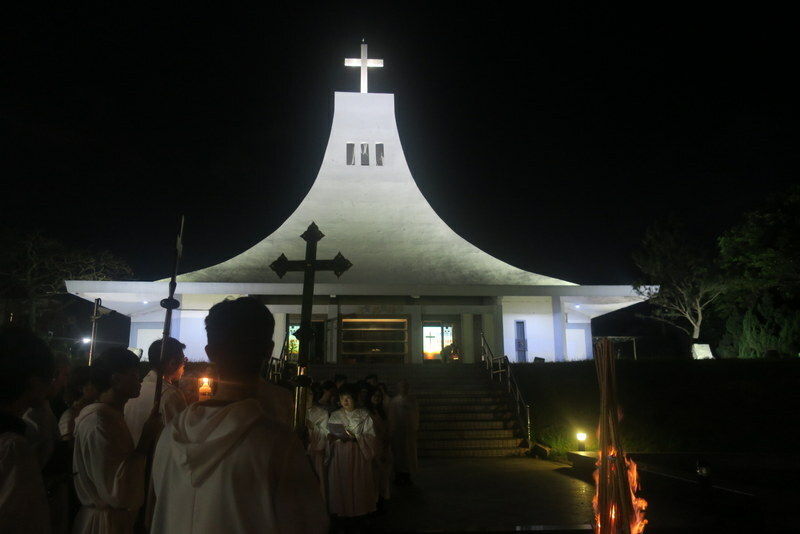 Christ is risen indeed, Alleluia! 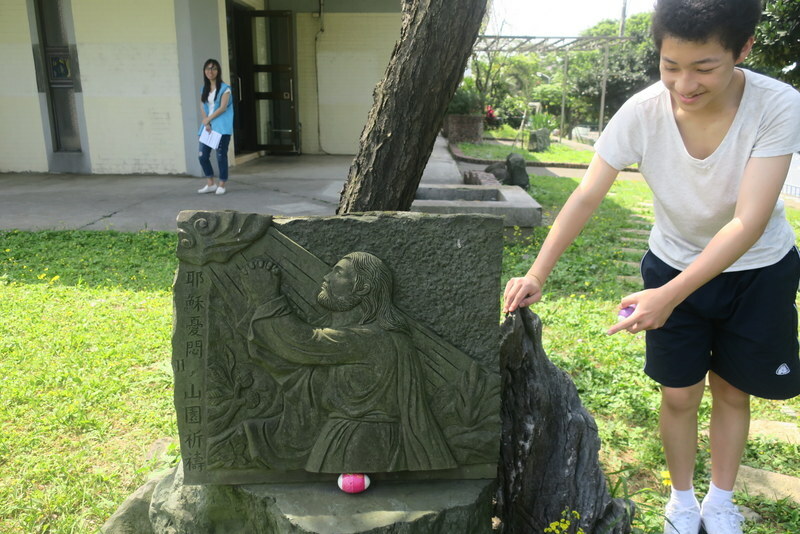 It’s Holy Week and the sun is shining all week in Taipei, yippee! 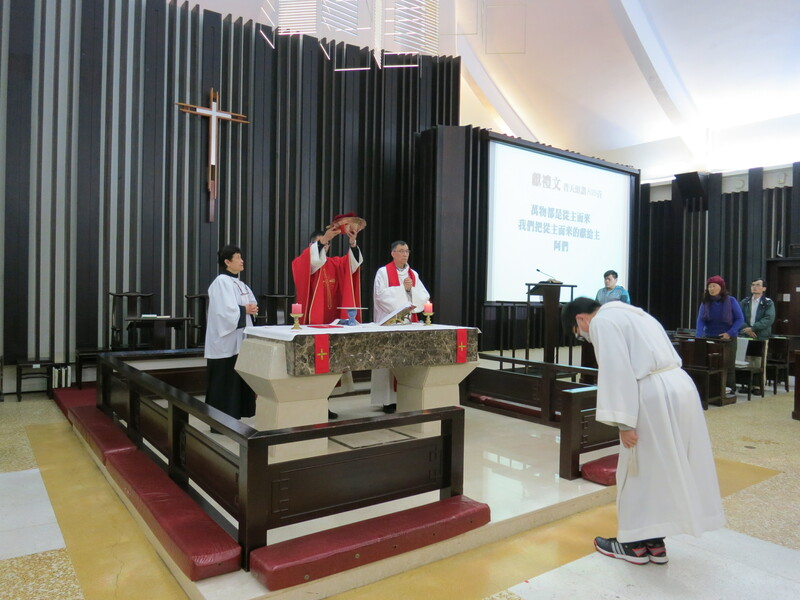 Today is Maundy Thursday, and appropriate for Maundy Thursday is a visit to Zhongshan Presbyterian Church (中山基督長老教會) in central Taipei (62, Linsen N. Rd 林森北路62號), where the small stained glass window above the altar is of Jesus praying in the Garden of Gethsemane, while his disciples are fast asleep nearby. 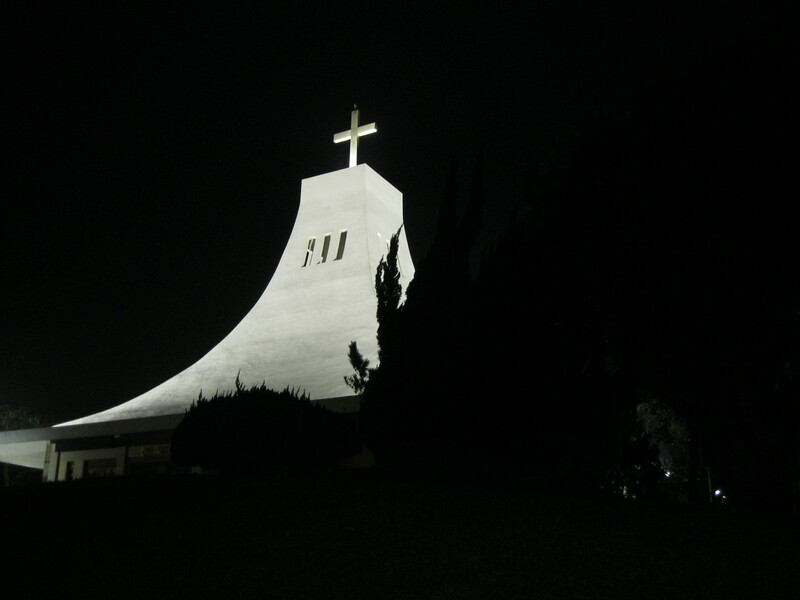 This morning, very early, I cycled past this church on my way into Taipei. The sun was shining, the sky was blue and the traffic stopped long enough for me to take some photos without getting run over. The church does look splendid in the sun! 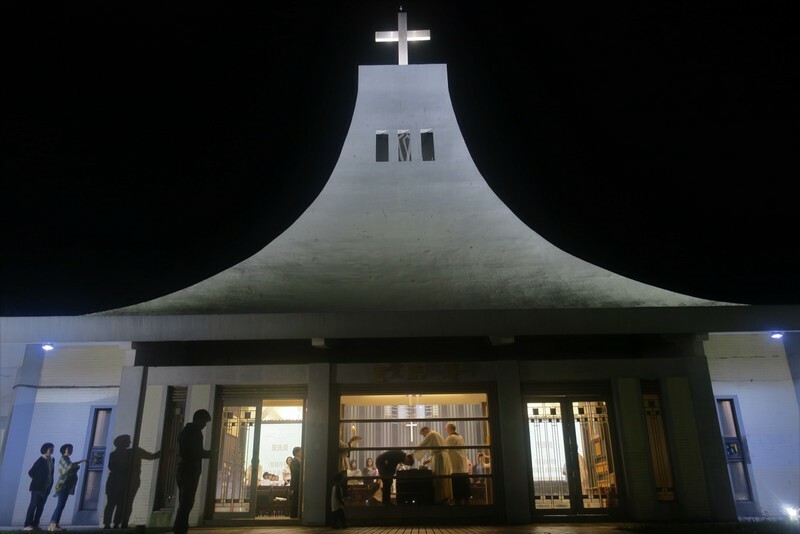 And what’s so special about this church? Well, it’s very historic, built in 1937 in a Gothic style, with a 3-story bell tower. 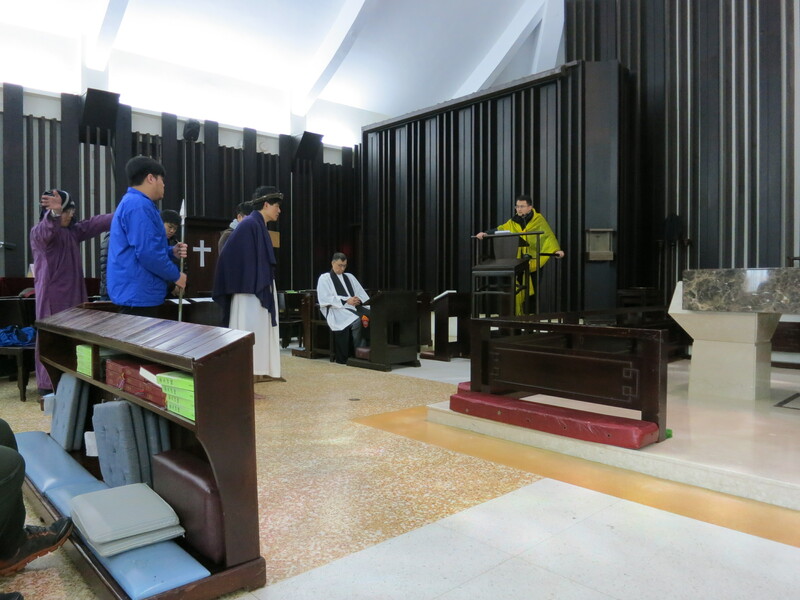 This was during the Japanese era 1895-1945, and it was built as a Japanese Anglican Church, Nippon Sei Ko Kai (NSKK) with all services in Japanese. 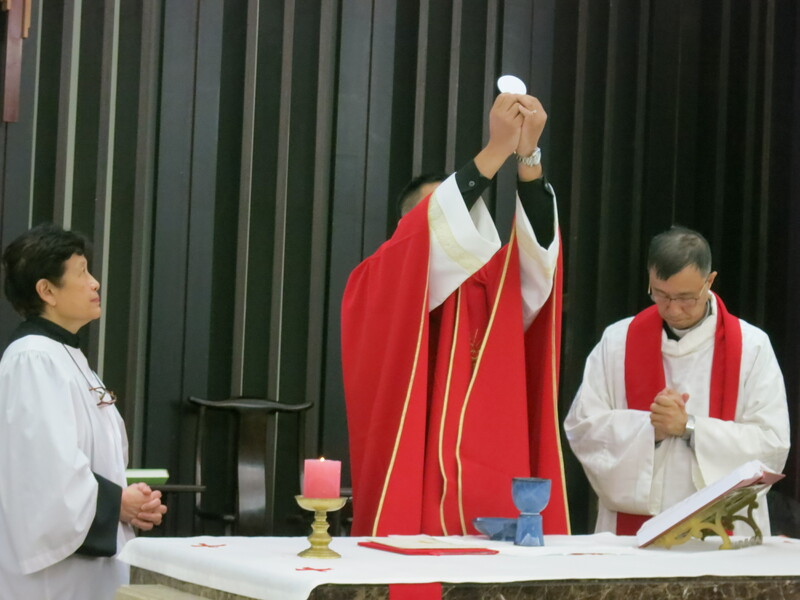 Taiwan at the time belonged to the NSKK Diocese of Osaka. 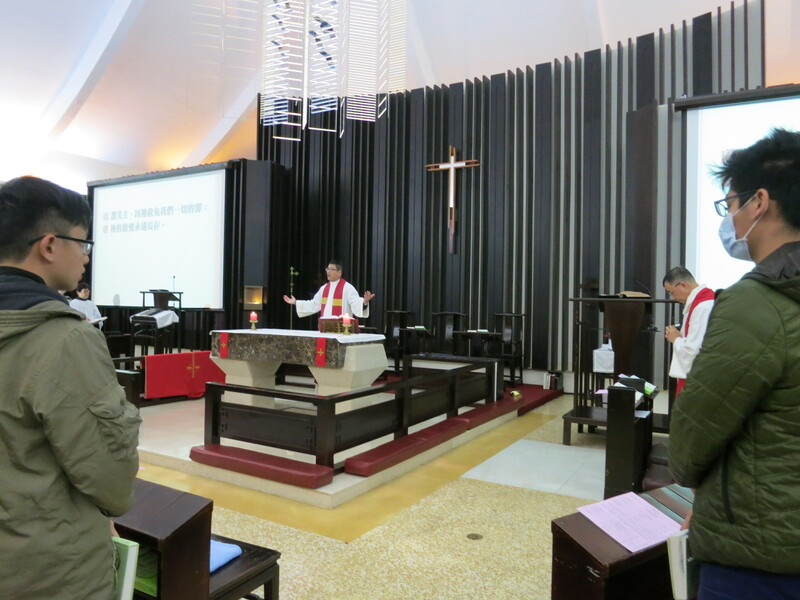 This is the most famous of all the church buildings in Taiwan built by the Japanese Anglican Church. 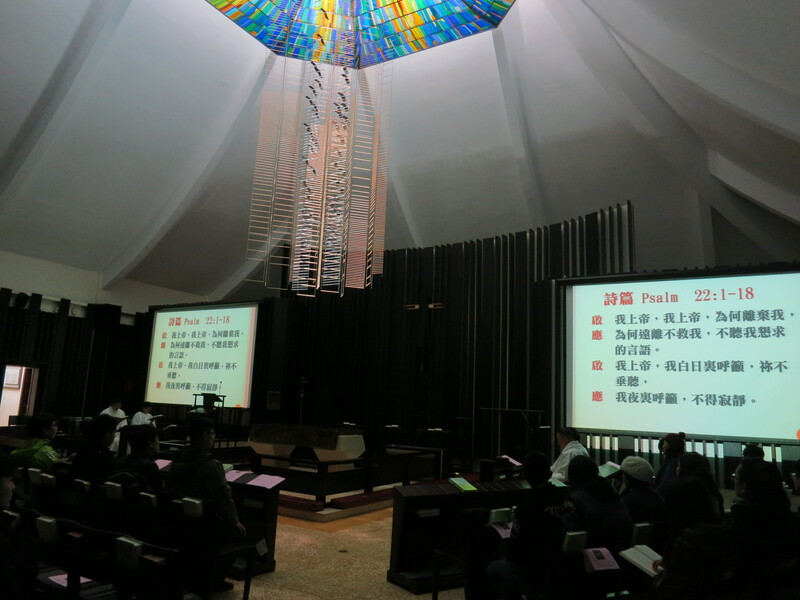 Apparently, as it was near a place called Taisho Cho, its original name was “Taisho Street Anglican Church”. 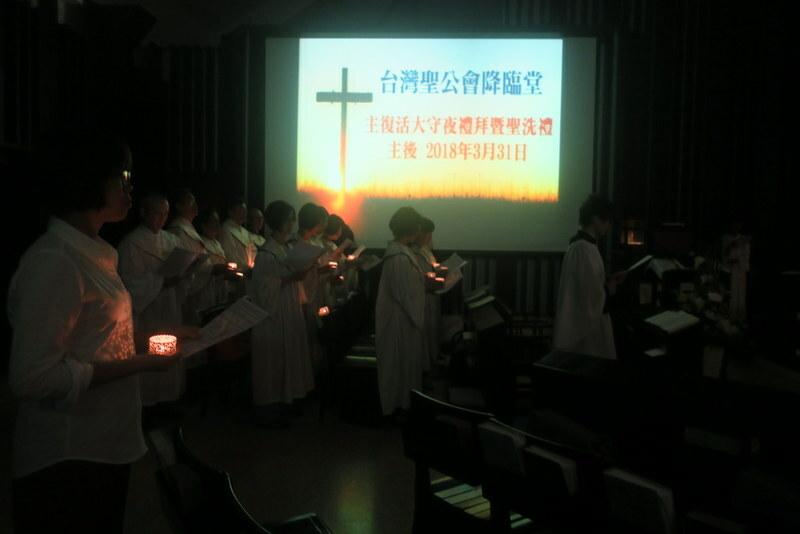 But in 1945-6, when the Japanese left Taiwan, there was no Taiwanese Anglican / Episcopal Church to hand it over to, and in 1947 it became the Zhongshan Presbyterian Church; the church celebrated their 70th anniversary in 2017. 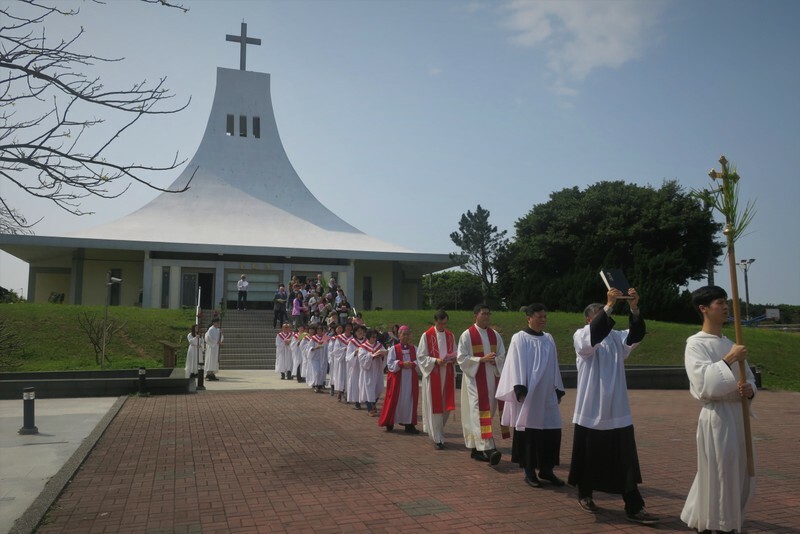 The Taiwan Episcopal Church was founded much later, in 1954. 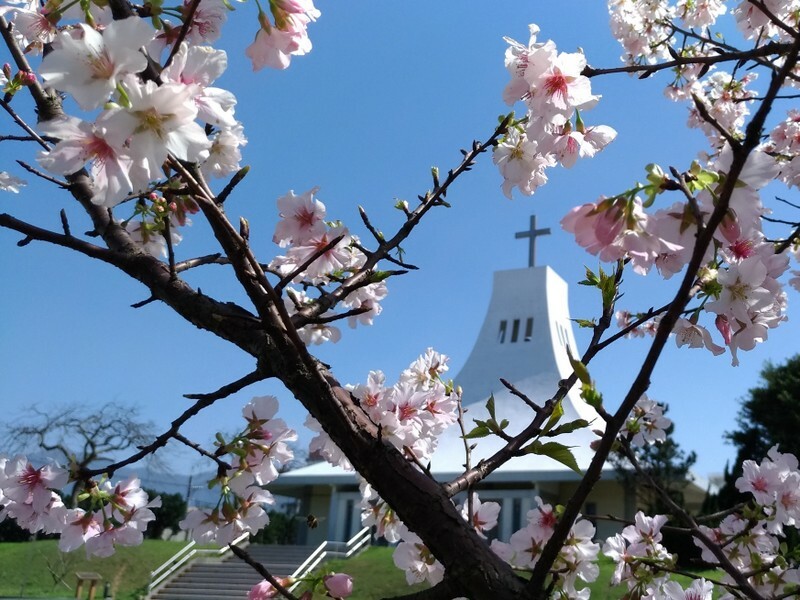 Fast forward to 2004 and Taiwan Episcopal Church (Diocese of Taiwan) began a companion diocese partnership with the NSKK Diocese of Osaka, which is still going strong today. 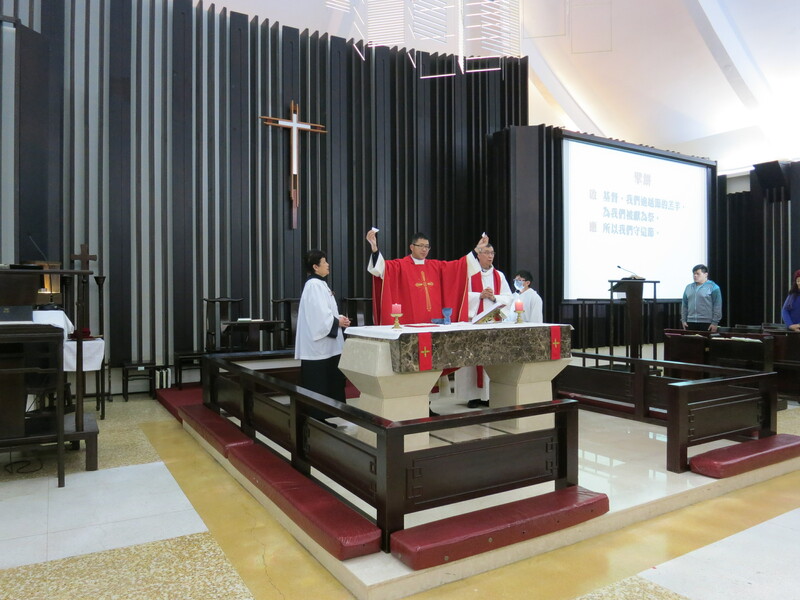 And we have a good relationship with the Zhongshan Presbyterian Church today too – and Bishop David J. H. Lai has preached at this church many times. 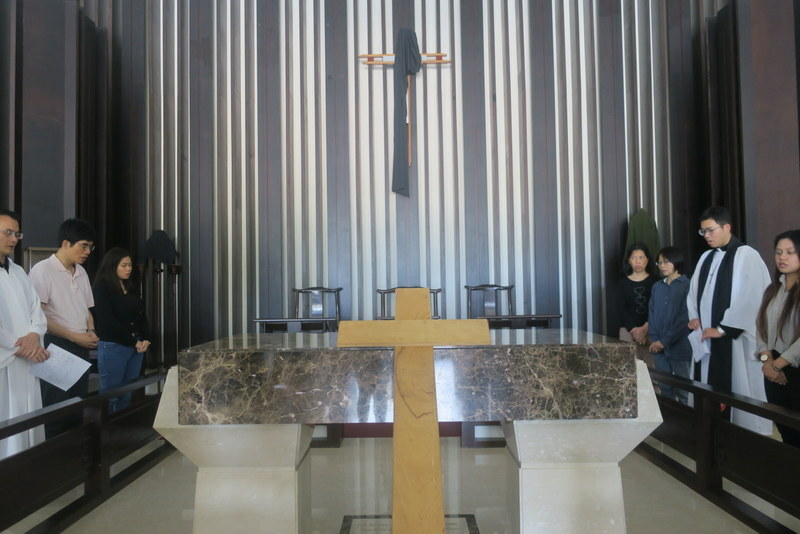 One of the places we like to take our Japanese visitors is to see this church. It really is full of history, and it really looks quite amazing surrounded as it is by all the high-rise buildings and all that traffic, whizzing past on both sides! And so, back to the stained glass window and its significance for Maundy Thursday ~ wishing you all a meaningful and blessed Holy Week! 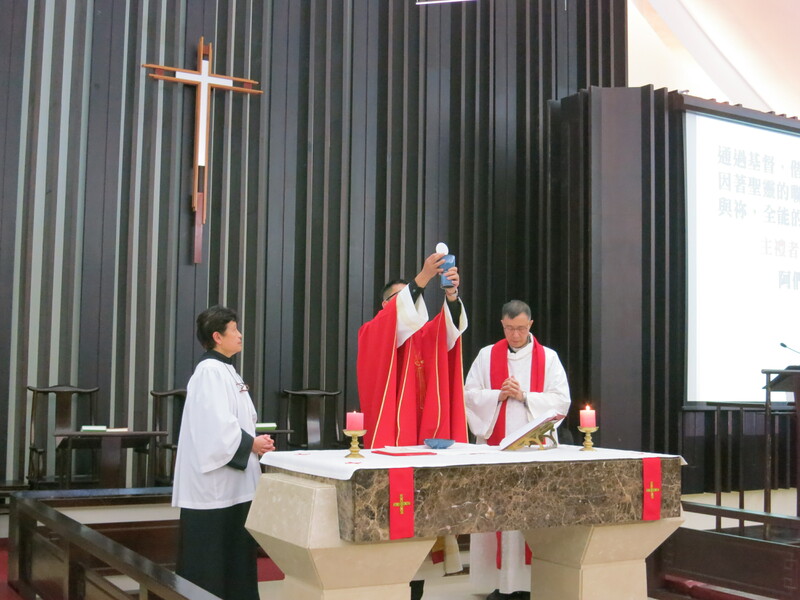 A few highlights of our lunchtime service at Advent Church today…. 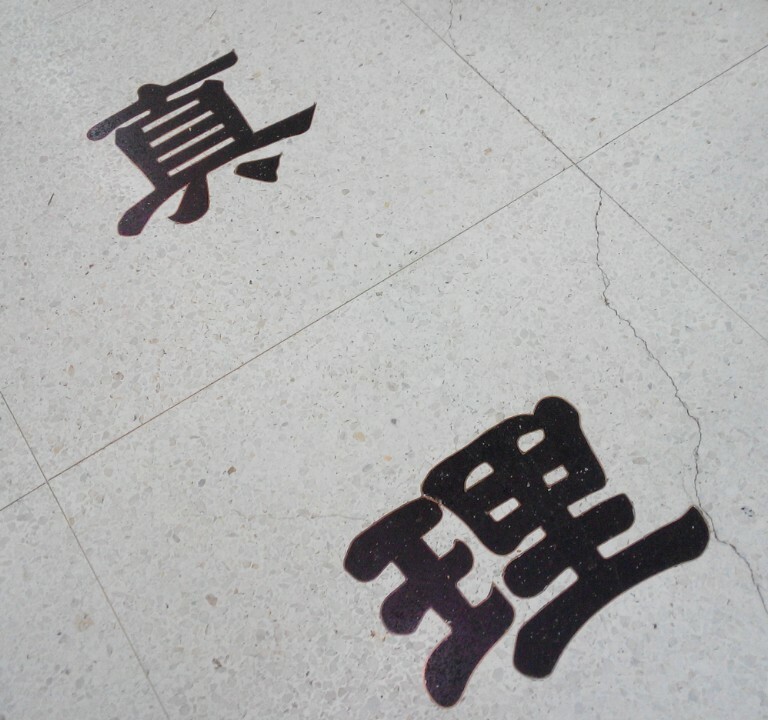 ‘‎真理‬'(zhēnlĭ) ‘‎Truth’‬ ‪~ the Chinese characters are carved on the nave of Advent Church, along with the characters for ‘the way’ and ‘the life’ above and below. A suitable thought to meditate upon this Good Friday afternoon. Pouring with rain and with a strong wind as a very late cold front has suddenly arrived in the last day or two bringing with it some horrible weather and a return to winter temperatures ~ hey, we’re used to it by now, but this winter seems far from over, and it’s almost April! 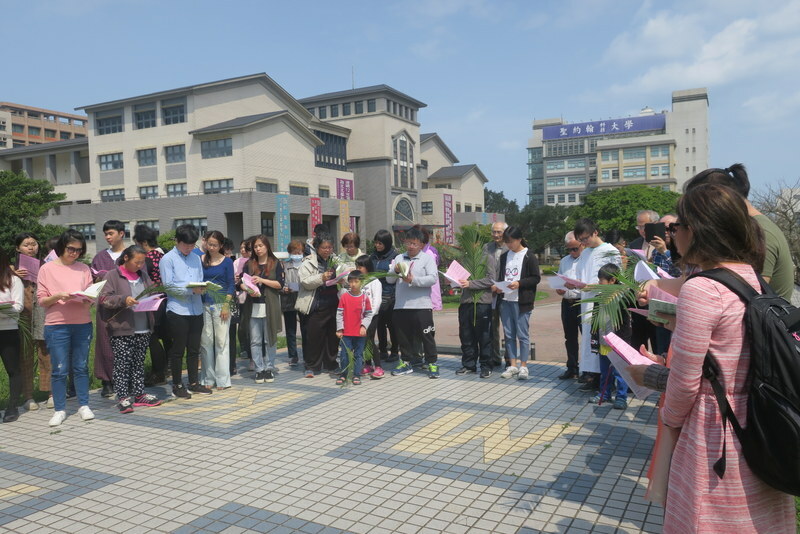 But as you’ll see from the photos below, some of our hardy students are still walking around in T-shirts saying they can’t understand what all the fuss is about! 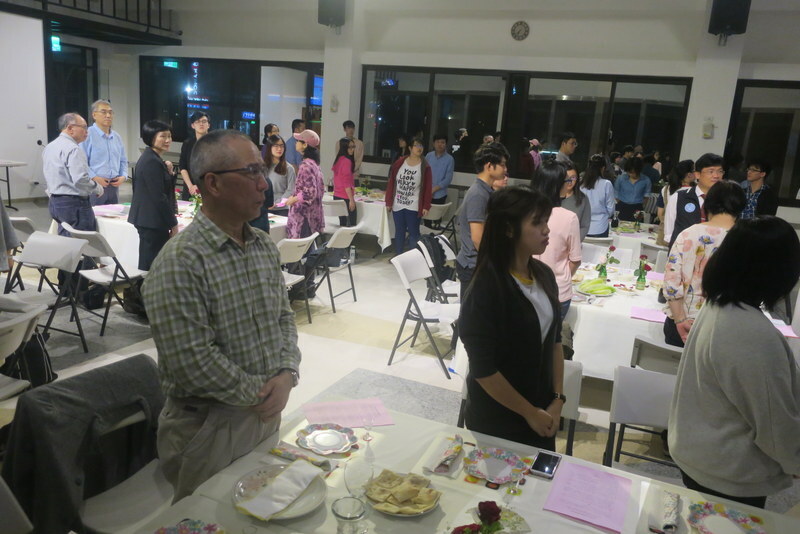 Our annual Maundy Thursday service was last night, and Thursday evening is also the evening when our St. John’s University student fellowship meets, usually about 30 of them. Actually they meet every evening for different activities, but their main gathering is on Thursdays. 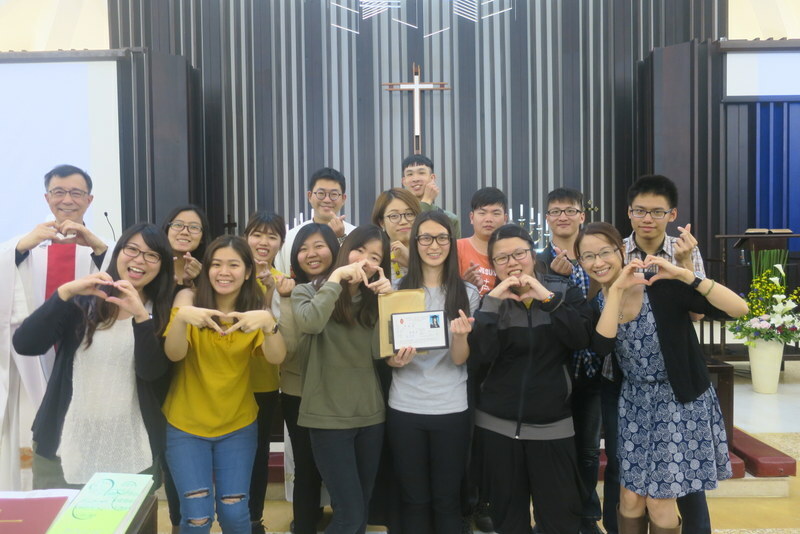 It’s open to any of our students, and it seems that about half of those who come are already Christians and half not. 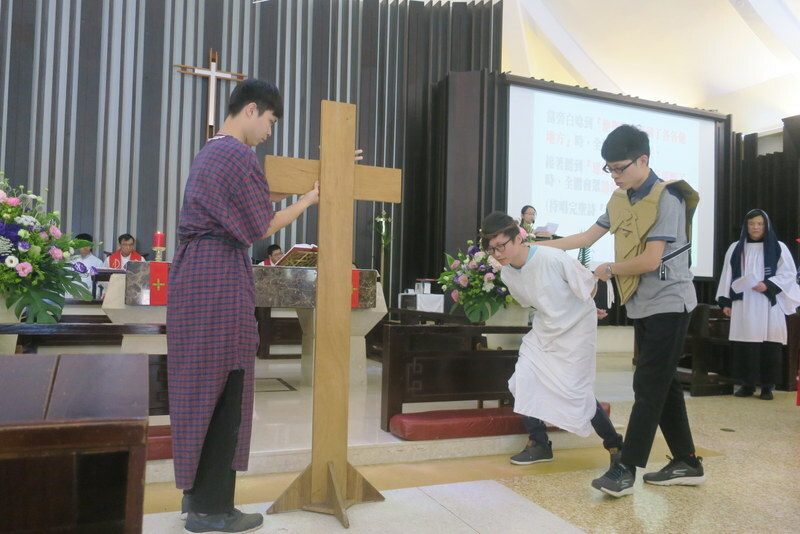 Some are interested in the Christian faith, some would really like to be baptised but too scared to ask their parents, others have asked and their parents say no, others are waiting until they they reach their final year hoping their parents will come round in the meantime. 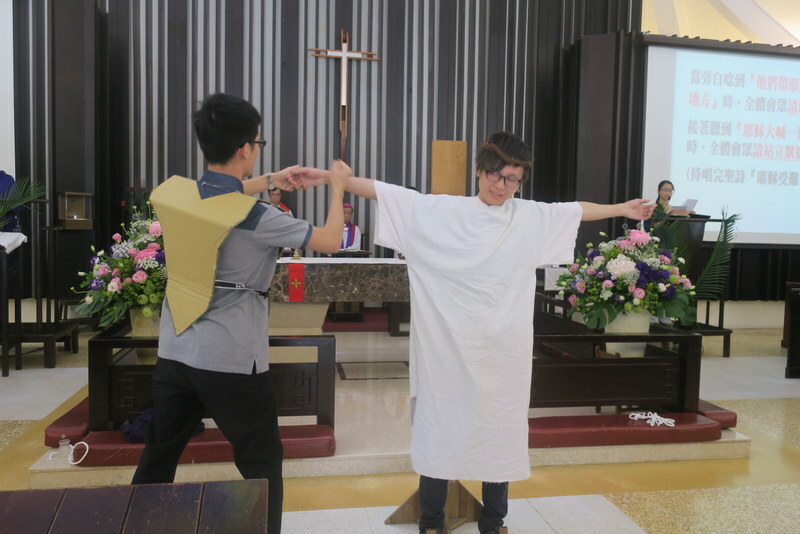 But there’s also many who are not interested, they’re here because they like the friendship and fun. Everyone’s welcome! 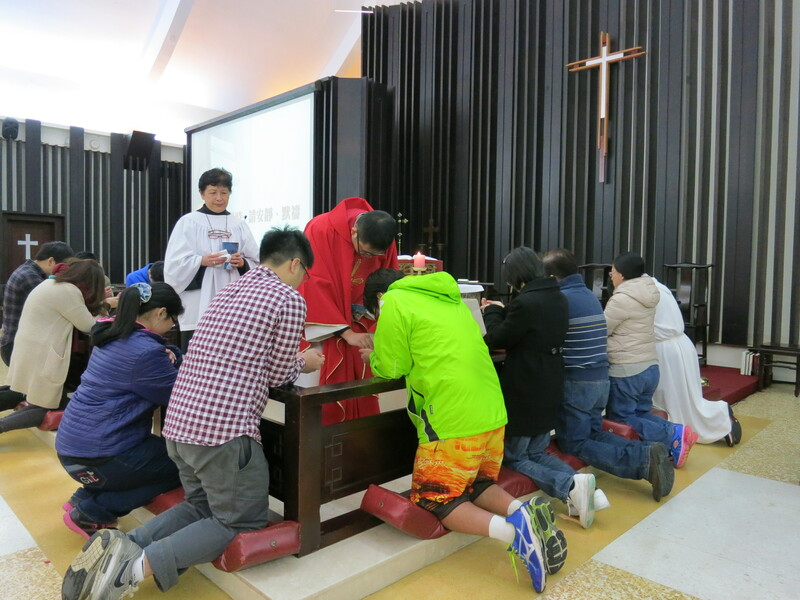 But they all volunteered in equal numbers for the foot-washing, either to have their feet washed or to carry water and arrange the towels and bowls. 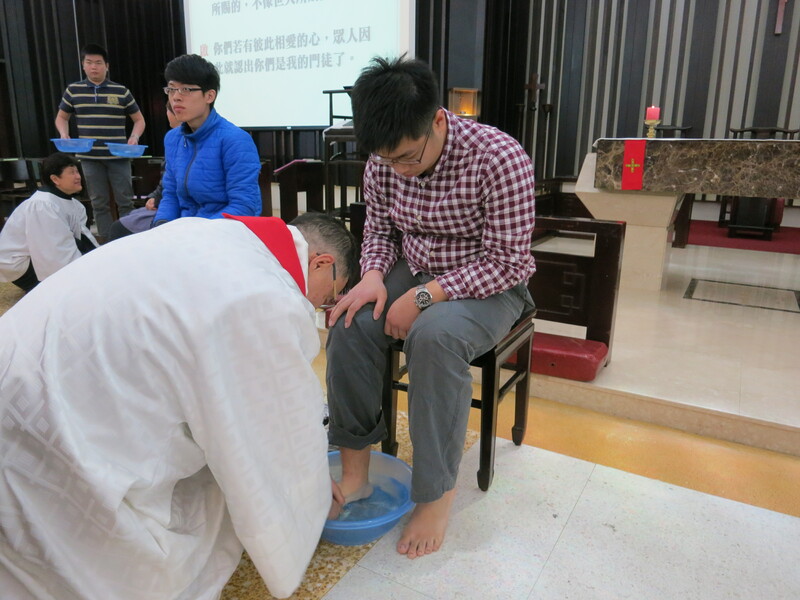 So we had 12 volunteers for foot-washing, 11 of them students from our student fellowship, plus Yu-lin who works with the students in our chaplaincy office ~ and 4 foot-washers, our 2 clergy, one churchwarden and Shu-Jing who also works with the students in our chaplaincy office…. 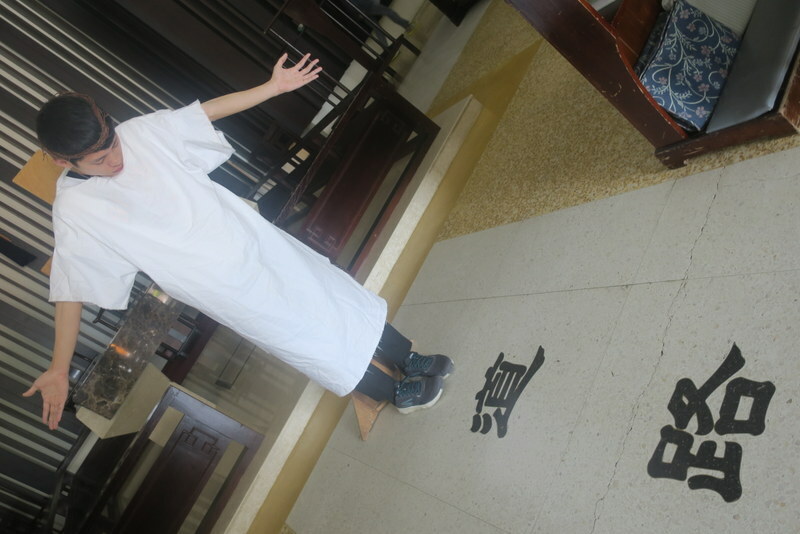 One of our students, Mei-han is preparing for her baptism on Easter Eve, she had her feet washed by our churchwarden. 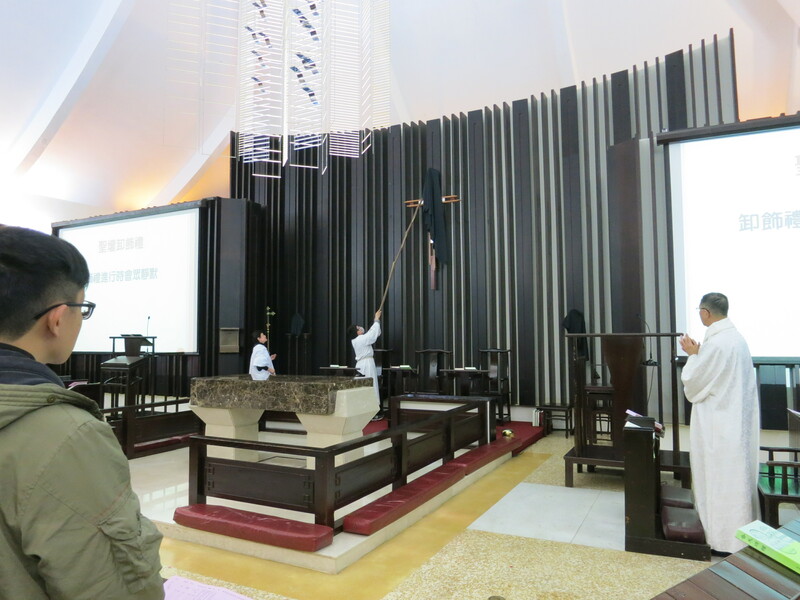 After the foot-washing, we had communion, and at the end of the service, prepared the church for Good Friday ~ cleared the altar and covered the crosses with black cloth, and then read Psalm 22 in a darkened church…. PS Turns out that the reason why the girls were all smiling in the foot-washing photos was because the water was freezing cold, and they’d mostly put both feet in the water together, hence their ‘grin and bear it’ kind of expressions! 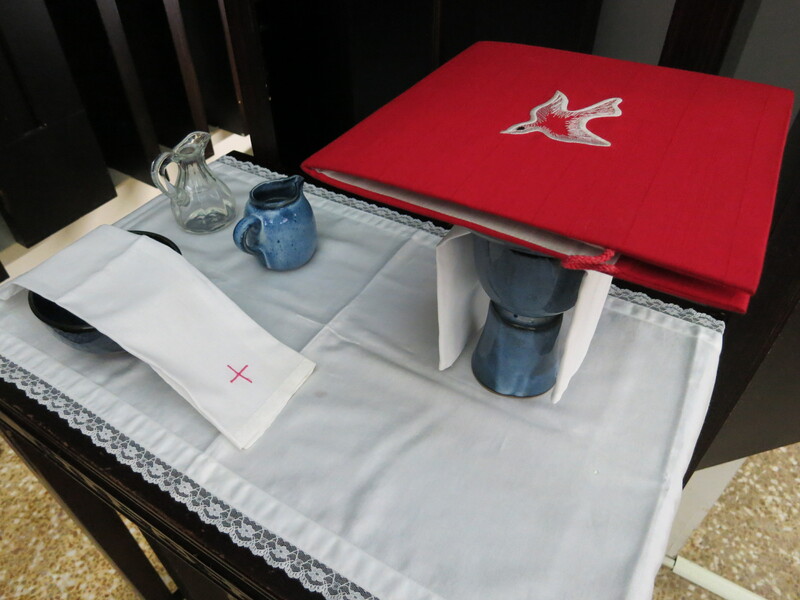 It’s Maundy Thursday, and there’s an air of anticipation in our chaplain’s office here at St. John’s University as our students get ready for the service tonight ~ many have volunteered to take part in the foot-washing, and they’re excited! 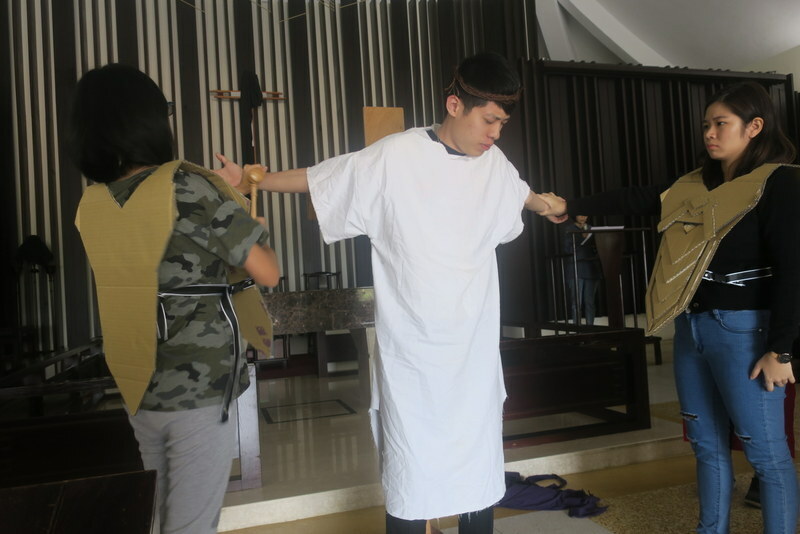 Excitement in Holy Week?! OK, it’s also the birthday of the leader of the student fellowship, and they’re all trying to keep their plans secret, but he knows something’s afoot and, well, we’ll just wait and see what happens! 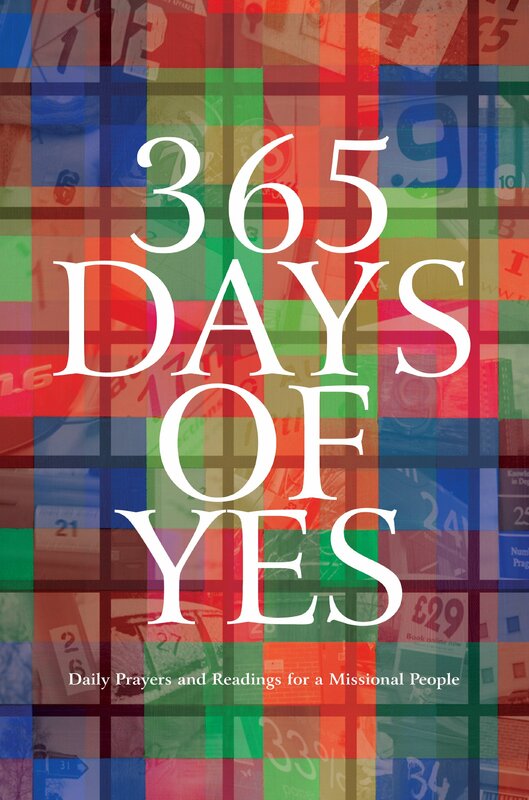 While I was in the UK last year, I was given a copy of the CMS publication, ‘365 Days of Yes’, subtitled ‘Daily Prayers and Readings for a Missional People’ (2012). Yes, I admit the bright and beautiful cover was the key attraction, but having got it back to Taiwan, the next challenge was to start using it. So on January 1 this year, I dutifully launched forth on a whole year of readings and prayers. And y’know, I was pleasantly surprised. It’s really quite good! A big surprise was to come across my own name in the book a few days ago with a story from one of my past CMS Link Letters. 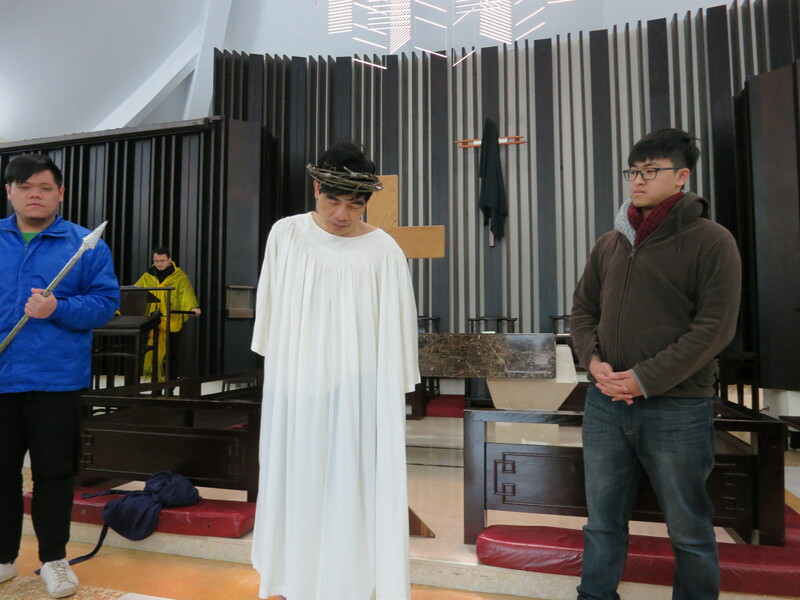 But an even bigger surprise was to come when I looked ahead to the reading for Easter Day; unbelievably CMS has chosen another one of my stories. And I’ve been thinking about it ever since, and spent some time looking up the original story. 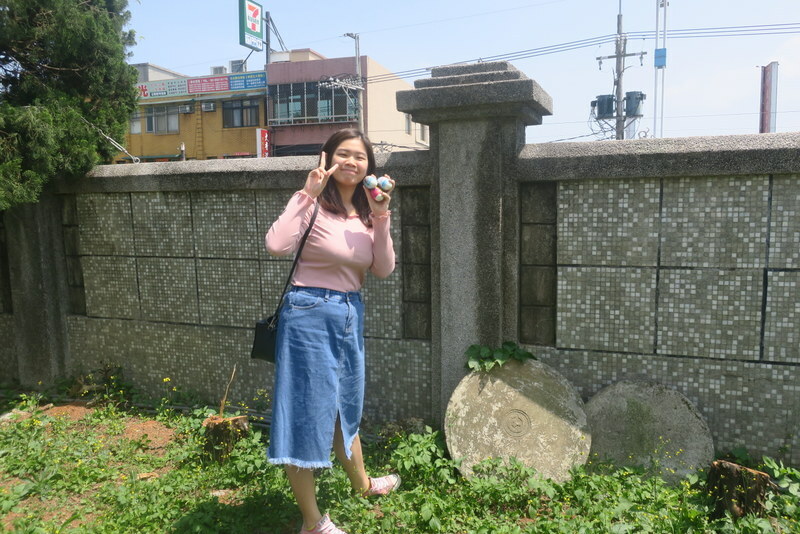 Turns out, the original was a reflection I included in my Link Letter in May 2008, which started as an experience I had during a church service on February 17, 2008 during my first – and so far only – visit to New Zealand. 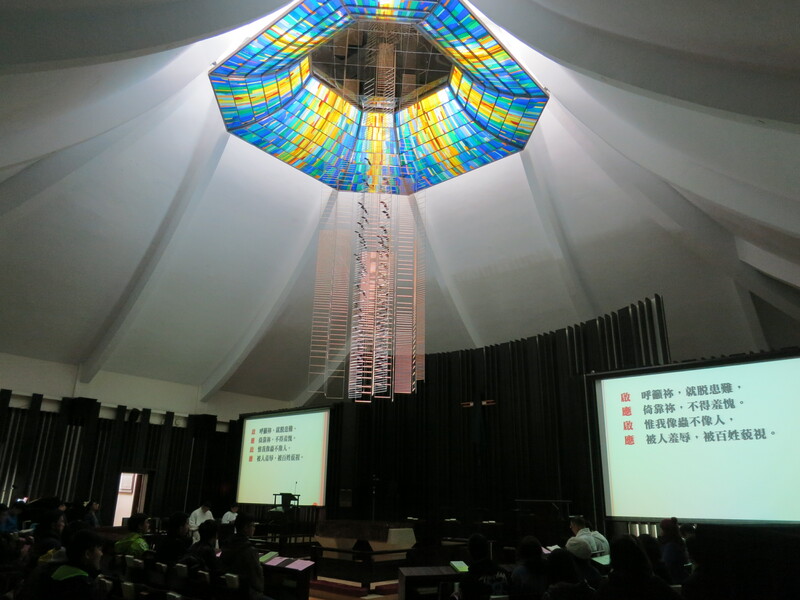 On February 23, 2008, our church here at St. John’s University, Taiwan, held a special Thanksgiving Service for the new stained glass that had been installed in the church roof over the previous few months. 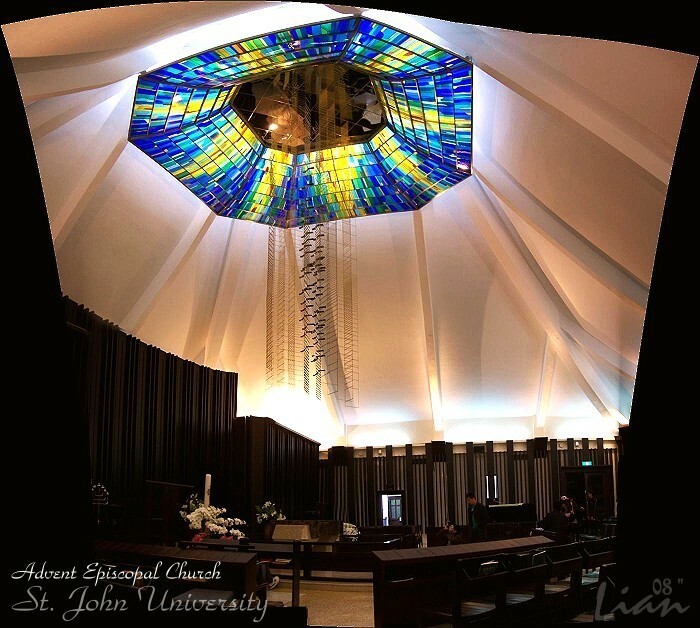 The stained glass depicts Christ the Light of the Dawn, inspired by the name of the church, Advent Church, and the association of Advent with the coming of Christ and the light that He brings into the world. 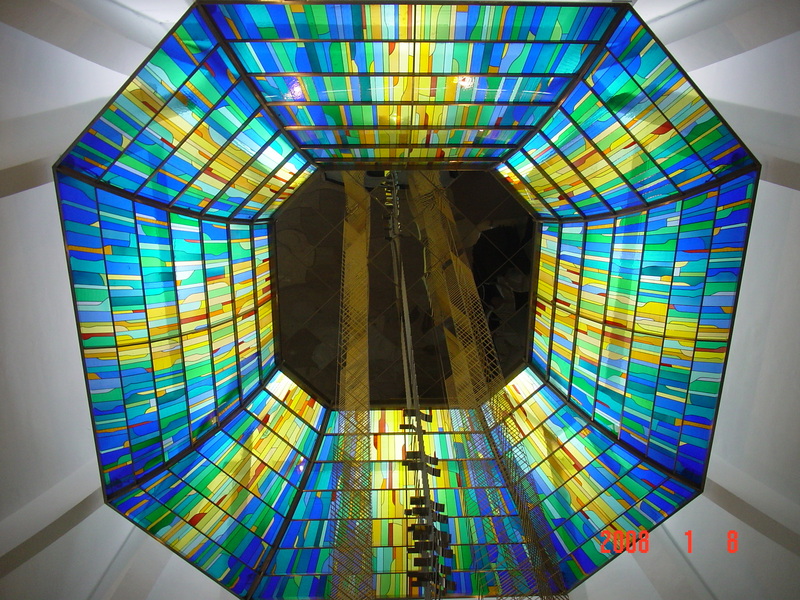 The glass is eight-sided, as is the baptismal pool at the main entrance to the church. Numbers are important in Taiwan. 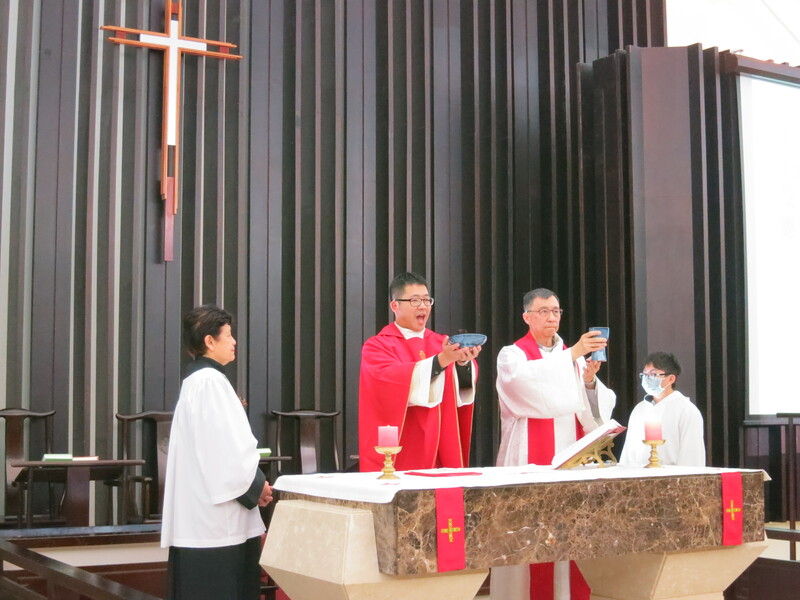 Our chaplain and rector, Rev. 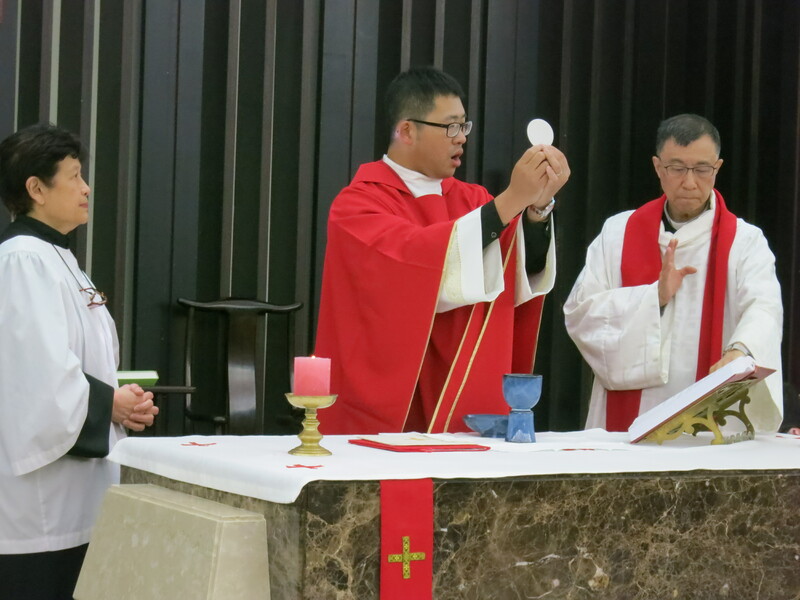 Lennon Chang is also Professor of Mathematics here at St. John’s University and his specialty and great passion is Calculus, so he loves to explain the significance of different numbers. Eight (八 Pinyin: bā) is an auspicious number in Chinese culture (which is why the opening ceremony of the Summer Olympics in Beijing began on 8/8/08 at 8 seconds and 8 minutes past 8 pm local time) and the digit 8 also matches the mathematical symbol of infinity ∞. In the Bible, the eighth day of creation was the first full day of the newly-created world, and circumcision was traditionally carried out on the eighth day. New creation, new beginnings, new hearts! 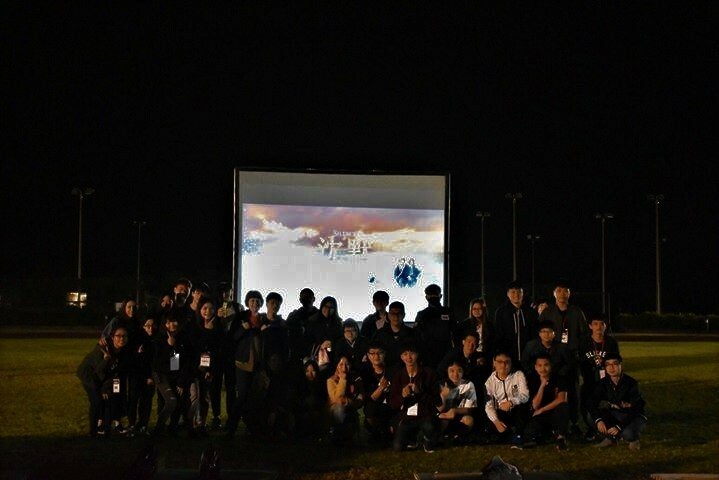 “Over Chinese New Year, I had the opportunity to visit New Zealand. On the last Sunday I joined my friends for worship in their home church in Paraparaumu (that’ll test your Maori pronunciation!). 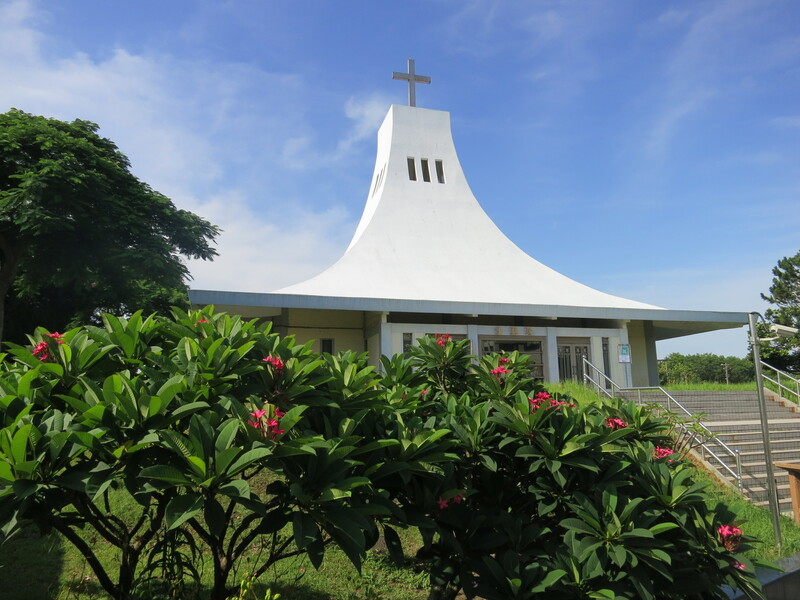 The church itself is built right next to a small airport, used mainly by light aircraft. 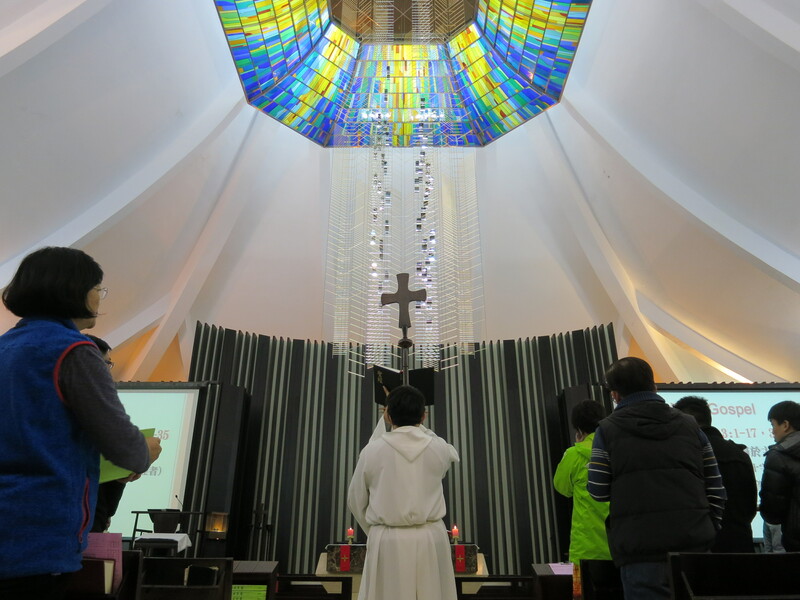 The large window behind the altar was of clear glass, and through the window there was a view of trees, hills and sky. That Sunday morning, as we were praying the final post-communion prayer (the one where we are sent out into the world in the power of the Spirit, to live and work to God’s praise and glory), suddenly through that altar window I saw in the distance a helicopter plummeting head-first towards the ground, followed by pieces of wreckage. The few of us in the congregation who saw it knew that a crash was inevitable, with almost certain death for the pilot. Later we discovered that a light plane had collided in mid-air with the helicopter, both then crashed onto neighbouring houses and shops, and all three people onboard died. 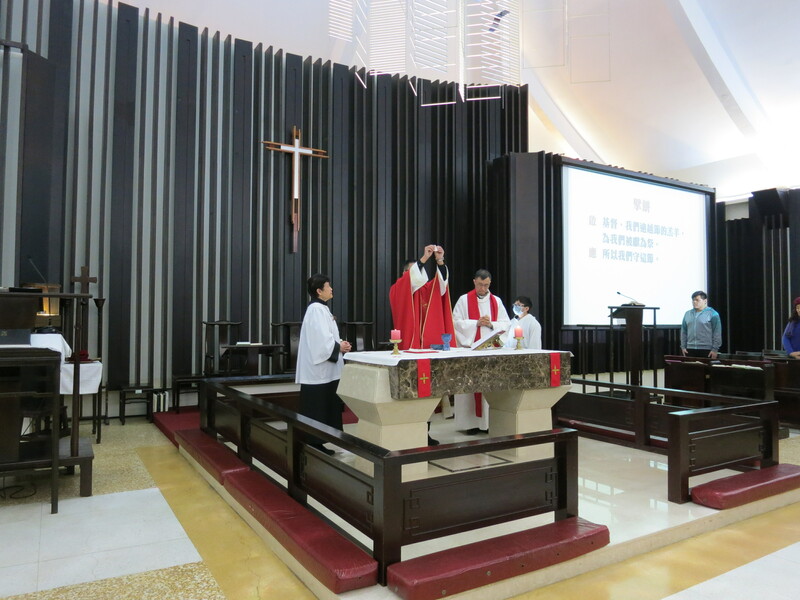 Six days later, I was back in Taiwan, and attending the Thanksgiving Service for the new stained glass. 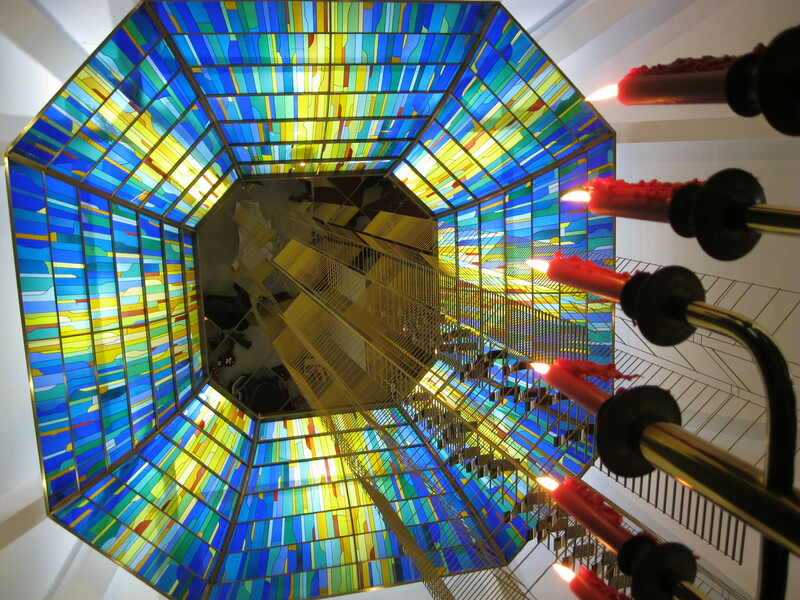 The artwork is magnificent, full of blues, yellows and reds; with a Jacob’s ladder sculpture hanging down towards the altar from the centre. 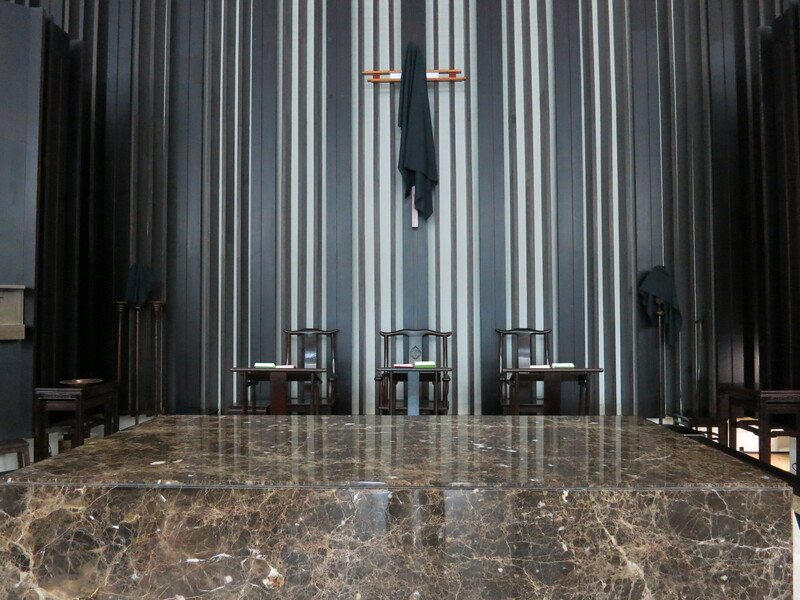 The altar itself is of marble, and usually left bare, reminding us of the stone that Jacob slept on when he had his dream of the angels ascending and descending the ladder. 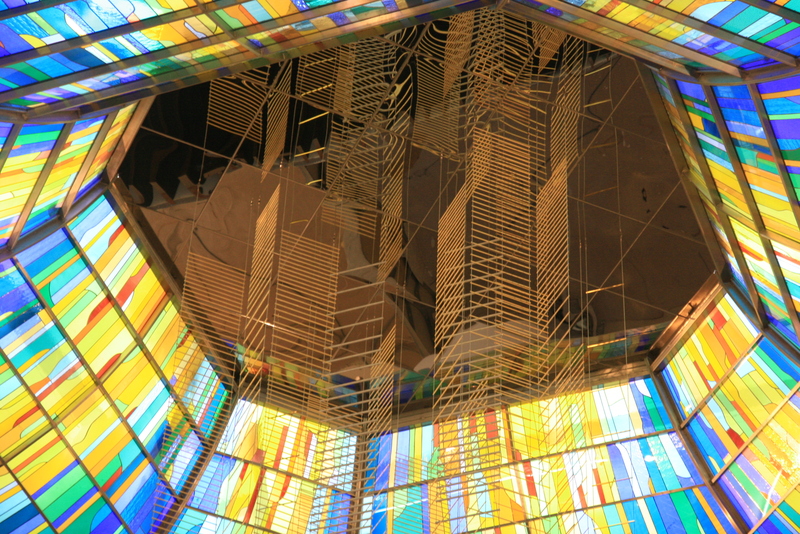 The top of the sculpture, the flat part of the ceiling, is covered in mirrors, giving an impression of never-ending ladders, going on and on, up and up into eternity. The whole artwork vividly depicts the glory of God and the light of Christ, with the ladders calling us to come closer to God in prayer, joining heaven and earth in one glorious whole. I can still remember that helicopter crash and that service, in fact my New Zealand friends reminded me about it only a few weeks ago. There’s an official account of it here. I remember the gasp of shock and horror which echoed round the church from the few of us who had our eyes open and saw what happened. 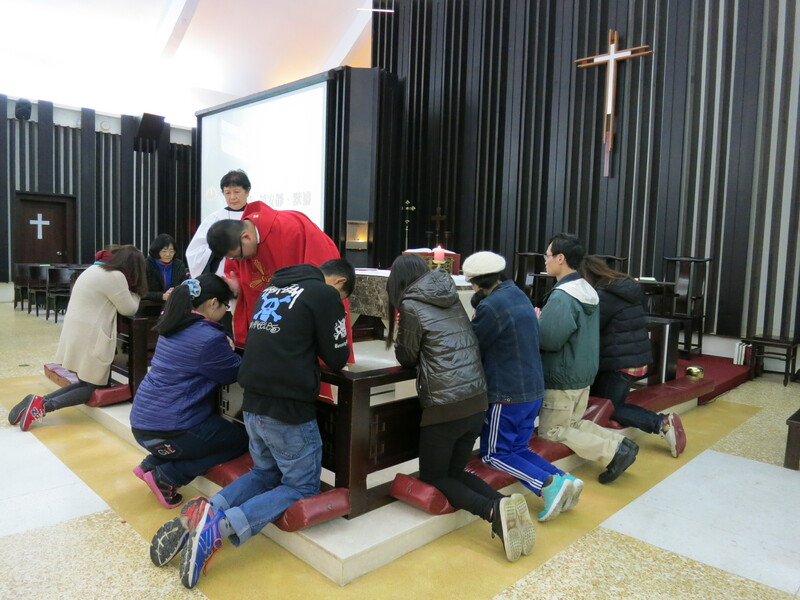 The others who saw it were mostly the youth group who were sitting up high on the balcony at the back of the church. I remember the news reports at the time and the tragic images of the crash site, and I remember the vicar calling later to ask if I was OK. It was tragic, horrific and kind of bizarre all rolled into one. And now we’re in Holy Week 2016, and sadly death and destruction once again dominate the news reports. Our screens are filled with tragic tales of grief and despair, of missing loved ones, of broken hearts and shattered lives in the city of Brussels, the heart of the European Union. Our hearts and prayers go out to them all. 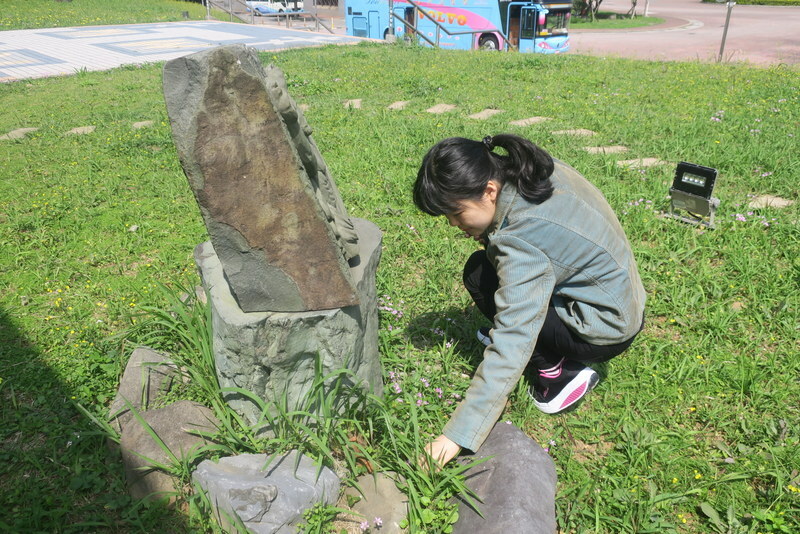 We do not understand why and how people could willingly bring about such death and destruction. All we can do is to cry, pray and plead with God for mercy, justice and peace to prevail. 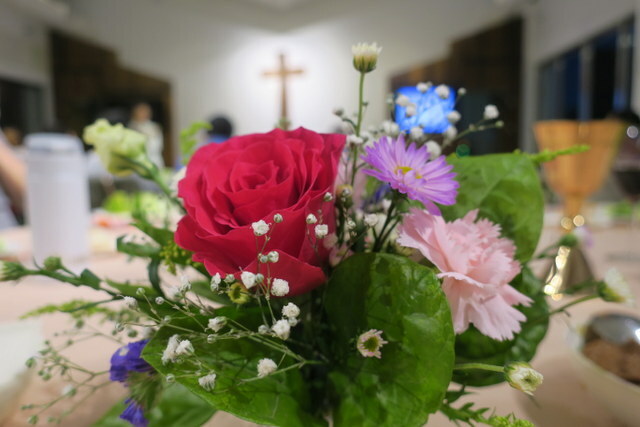 All we can do is to hold onto the promise of Easter, the promise of the resurrection, of death being conquered, of new life in Christ, of reconciliation with a loving God who cries with us in the pain and the brokenness. And so the reading for Easter Day in the ‘365 Days of Yes’ finishes with the prayer, ‘Lord, on this resurrection day, send us out again, inspired, refreshed, renewed to do our part in reconciling the world to you. Amen’. Amen indeed, and blessings for Holy Week and Easter to you all.